This amazing small island is a very special place for people who enjoy the natural world. 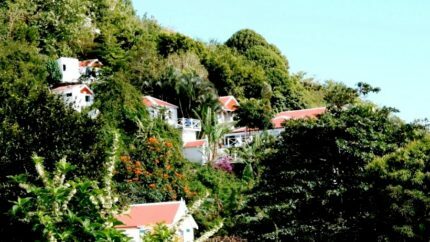 Saba really is off the beaten track – a natural green oasis in the Caribbean Sea – quite unlike any other “holiday destination”. 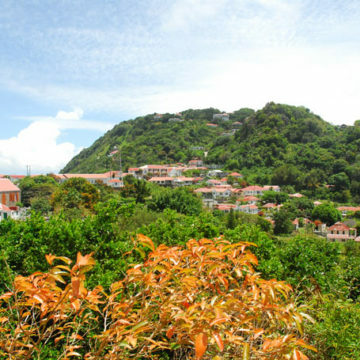 Saba is known as the “Unspoiled Queen” because of her rich, tropical, natural beauty. Dense rain forest covers the slopes of the imposing Mount Scenery, an extinct volcano. Saba will appeal to people who enjoy peace and tranquillity and appreciate an unspoiled natural world – on land and in the ocean. The island has modern facilities, but Islanders’ are very conservation conscious and have opposed any major commercial development. 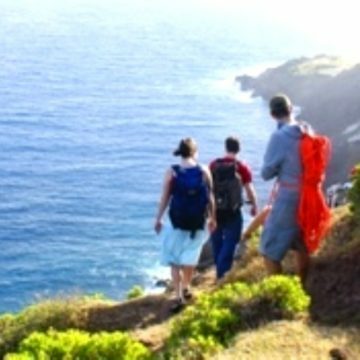 If you yearn for “undiscovered” parts of the world and enjoy the natural world – this beautiful island is the place for you. The rain forest is ideal for hiking with its unique diversity of flora and fauna – while the ocean is whole new world waiting to be explored. Due to its “anonymity” and lack of commercial development Saba is an unspoiled gem. Away from the hustle and bustle, you can completely unwind, explore this exquisite island for yourself and revel in its the natural beauty. On tropical islands the climate does not change much, warm and sunny all year. No matter what kind of holiday you prefer, you can enjoy it to the full. The ocean surrounding this tiny island has numerous dramatic and unique features like underwater pinnacles, lava flows and volcanic springs. These diverse habitats allow an exciting variety of marine life to thrive. Diving on Saba is spectacular – Saba will be a new destination for most divers. The amazingly clear water gives snorkellers views of the undersea world they would not normally see. Saba has the wonderfully healthy, tropical marine life you would expect from a protected environment, but in the ocean around Saba you will also see larger ocean-roaming creatures. Saba is recognised as one of the safest places in the world – mainly due to the local people, who are exceptionally friendly and welcoming. You can walk any part of the island at day or night without having to worry about your safety. It is said that many houses are left unlocked. 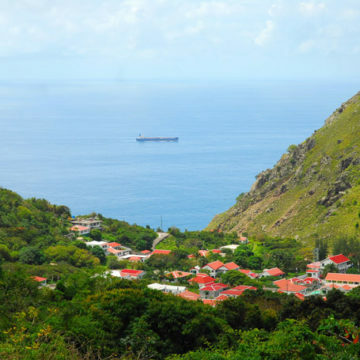 The island authorities maintain “there is no crime on Saba”. 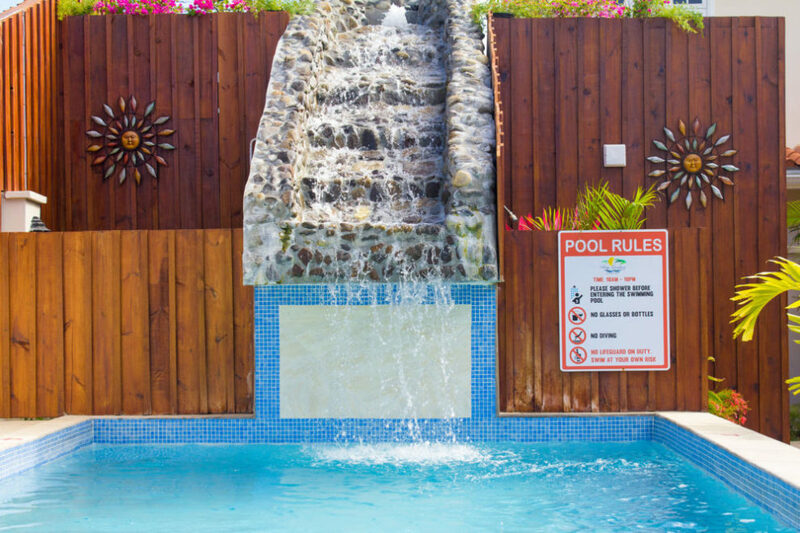 We are an ATOL licensed Caribbean holiday specialist with a wealth of local knowledge and many years’ experience on Saba. For many people our islands are “undiscovered” places – exciting new holiday destinations. 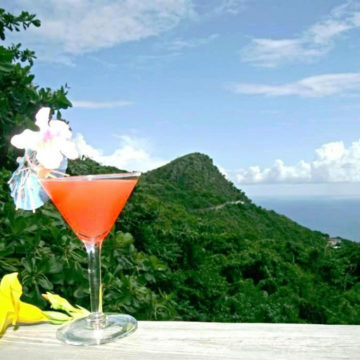 Having enjoyed and experienced much of what Saba has to offer, we know the island well. We can answer your questions from personal experience and tailor-make a holiday to your requirements and wishes. We enjoy talking about the island and would be delighted to discuss any plans you have for a holiday in this special part of the world. Saba is known as the “Unspoiled Queen” of the Caribbean because of her protected natural habitats which are home to an exciting, diverse and thriving wildlife. 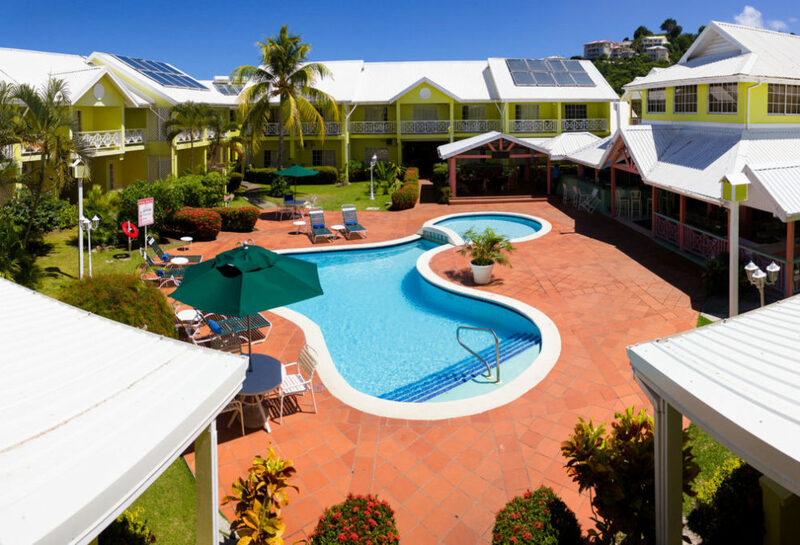 Saba will appeal to people who appreciate the natural world and want to enjoy it in peaceful surroundings. 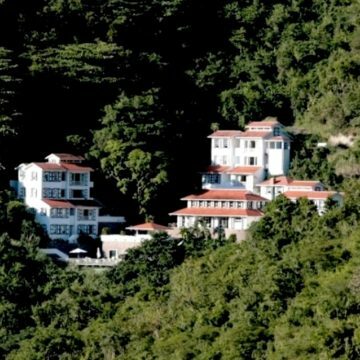 Saba has resisted commercial development – no high-rise hotels, no fast food, no casinos, no cruise ships and no crowds. The big attraction of this special island is the opportunity to completely unwind and discover the island and its natural beauty, in the rain forest or the ocean. 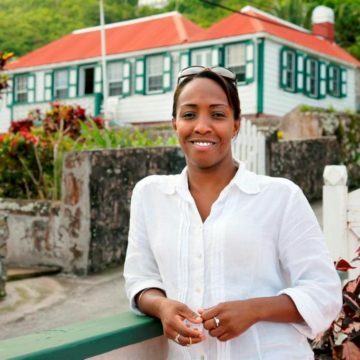 Saba, one of the smallest islands in the Caribbean, won the “2010 Top Island in the Caribbean”, a truly remarkable achievement for a tiny island. Islanders are very welcoming, with a huge pride in their unique island. Saba is just 5 square miles, the smallest island of the Dutch Caribbean, formerly the Netherlands Antilles. 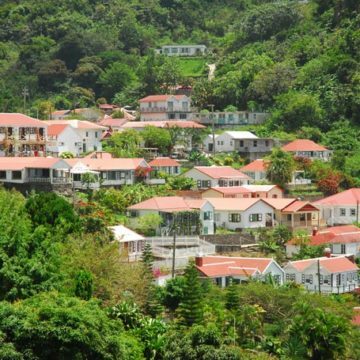 Saba is home to around 2,000 people living in 4 small villages. The island welcomes just 25,000 visitors each year, it really is “off the beaten track”, free of any mass tourism. Saba is in the eastern Caribbean, 170 miles east of Puerto Rico and 30 miles south of St. Martin/Sint Maarten. Most of the island’s residents live in the capital – The Bottom. “Bottom” is a corruption of the Dutch word for “Botte” which means bowl. Saba has just one road called . . . The Road. The Caribbean has always been an important trading centre and many nationalities have settled on Caribbean islands like Saba. In 1664 early French and Dutch settlers were evicted from Saba by the buccaneer Sir Henry Morgan. 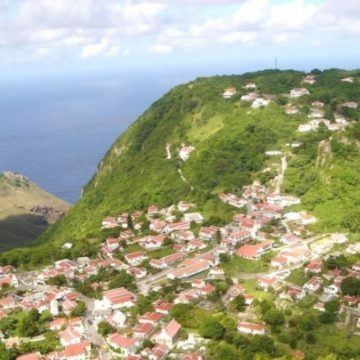 In the 17th and 18th centuries, Saba was a haven for pirates, most notably, Hiram Breaks, who coined the phrase “Dead Men Tell No Tales.” Saba was under English, French, Spanish and Dutch rule for many years, coming under Dutch rule in 1816, and is still part of the Kingdom of the Netherlands. There are two official languages on Saba: Dutch and English, but English is the predominant language. The various cultures have blended into a wonderful, typically Caribbean, peaceful and friendly society. 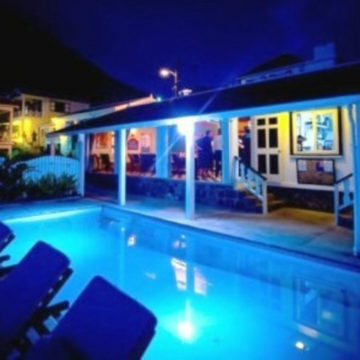 Saba’s nightlife is the kind of nightlife you will relish if you have come to enjoy the natural treasures of this small island – very low key. The mixed cultural heritage has produced a varied cuisine. Several restaurants have won awards for food and for fine wines. It’s easy, and safe, to walk around and discover the nightlife for yourself, in the hotels and bars, with live music some evenings and many themed events. 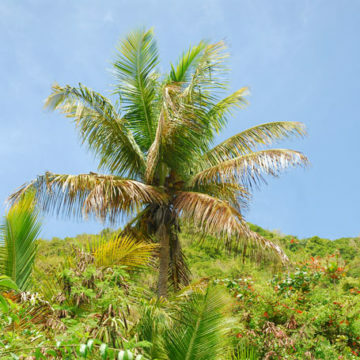 The weather is typically Caribbean, the air temperature averages 27ºC (81ºF), throughout the year. There is a refreshing ocean breeze that keeps humidity down, keeping you comfortable. As a tropical island the temperature does not change a great deal, warm and sunny all year. Saba gets around 42 inches of rain, most of which falls in the rainy/windy season, between September and December, It rains in short heavy (tropical) downpours, then out comes the sun once more. During this season winds are noticeably stronger, but rarely enough to disrupt any holiday plans. 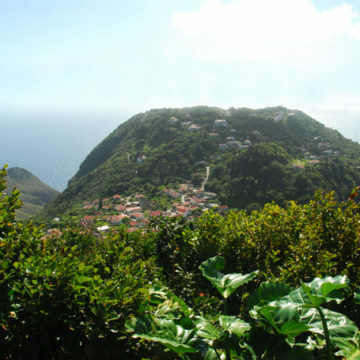 Saba is a dormant volcano that rises steeply from the ocean. 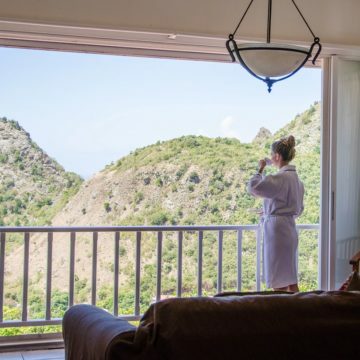 Saba’s volcanic birth formed massive rock and coral walls, hot springs, lava tunnels, huge pinnacles – tips of mountain ranges that rise to within 25 metres of the surface. A dramatic, exciting and staggeringly beautiful underwater world. 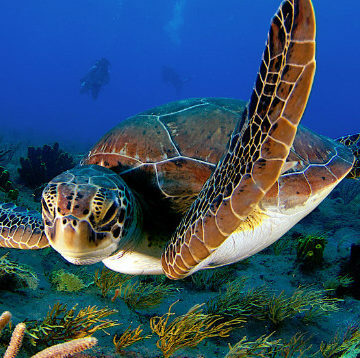 The Caribbean Sea is famous for its warm, clear water, colourful coral and creatures. The Atlantic coasts are visited by larger, ocean roaming creatures like turtles, sharks, dolphins and whales. Saba is famous for its exciting underwater features and large pelagic species especially the variety and abundance of sharks. Snorkelling and diving are the two most popular activities on the island. European divers have only recently discovered the fantastic diving on this tiny island. The crystal-clear water gives snorkellers and divers views of the undersea world they would not see anywhere else – very close to shore. A recent scientific survey made astounding discoveries on the Saba Bank Atoll, a coral-crowned seamount – the third largest atoll in the world with an enormous active reef. This is certain to make Saba one of the best diving/snorkelling destinations in the world. Everywhere you go you on the island you will be able to enjoy the wonderful natural world, tropical plants, colourful wild flowers and magnificent trees. Due to Saba’s rugged topography, and rich volcanic soil, there are six distinct ecosystems on the island, from the sea level meadows to the summit of Mt. 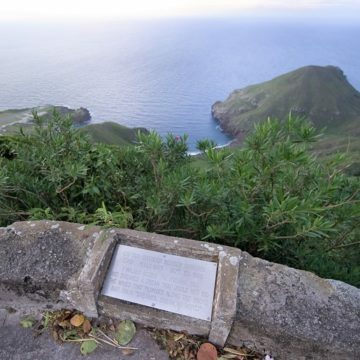 Scenery, the extinct volcano that created Saba. Each is a distinct habitat for plants and wildlife to thrive. The island’s vegetation and wildlife vary according to altitude so there is an interesting diversity of flora and fauna. 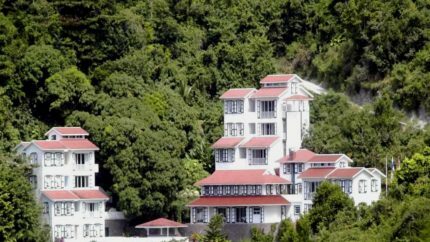 The Saba Conservation Foundation (SCF), a non-profit organisation, was established in 1987, to protect this unique environment. 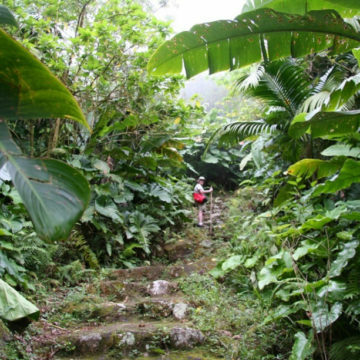 There are well established tracks for visitors to enjoy Saba’s countryside, some fantastic walks around the rain forest and spectacular coastal paths. 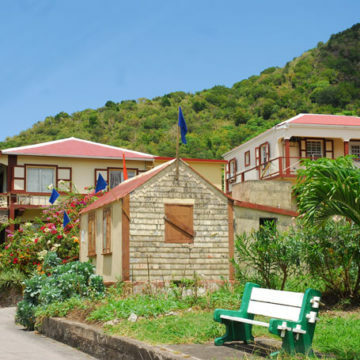 We have visited and personally selected our accommodation on Saba. 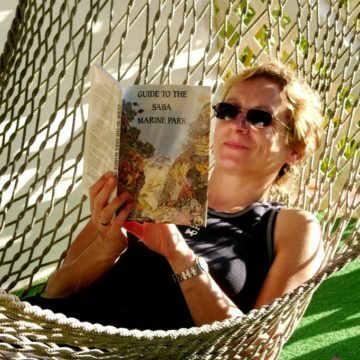 Our holidays are designed for “independently minded” people and we offer small hotels with character and personal service. There is a range of board options available at hotels, while apartments and studios give you the freedom to self-cater, if you wish. There are restaurants nearby, should self-catering lose its appeal. We are the preferred tour operator for some resorts and have the best air fares, prices and offers. 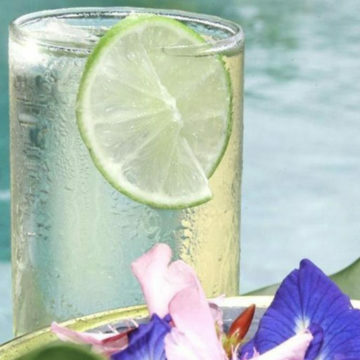 We offer a wide choice of services for you to get the very best from your holiday. On small islands, services like accommodation, vehicle hire, excursions, diving etc, get booked very quickly. To avoid disappointment these should be booked in advance. Saba is a volcanic island rich in flora and fauna with a level of diversity that seems impossible given its extremely small size – over 60 species of birds and 200 species of fish. The islanders’ heritage of farming, fishing and seafaring has generated a pro-active appreciation of their environment. The Saba Conservation Foundation protects and preserves the natural environment and cultural heritage. 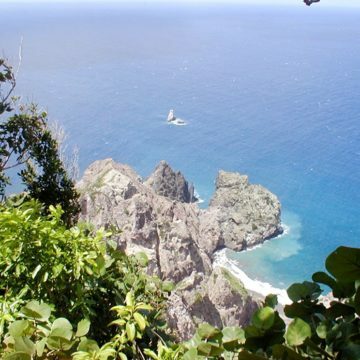 The Saba Marine Park protects the ocean around the island. 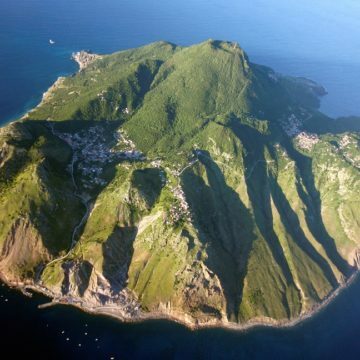 Fewer than 2,000 people live on this small island, in four small villages. It’s very easy to enjoy the natural world of this special island. You are surrounded by remarkable plants, colourful wild flowers and magnificent trees. 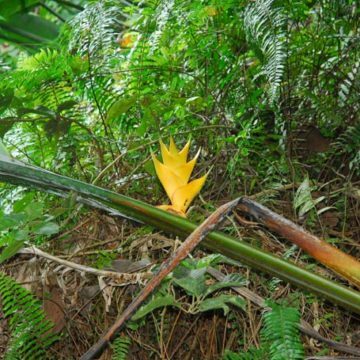 Saba’s plant life is a mixture of indigenous species and species brought in by the early colonists. Due to Saba’s rugged topography, and rich volcanic soil, there are six distinct ecosystems on the island, from the sea level meadows to the summit of Mt. Scenery: coastal area, shrub land, deciduous forest, evergreen forest, tropical rainforest and the tropical cloud forest. Each of the six areas is a different habitat for plants and wildlife to thrive. The island’s vegetation varies according to altitude and rainfall leading to an interesting variation in the wildlife in each area. 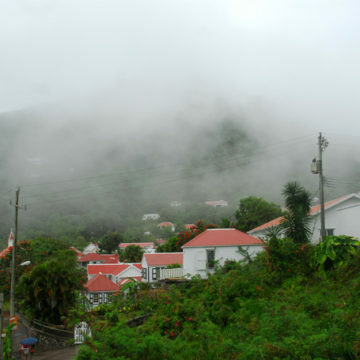 Saba’s dominant feature is the impressive peak of the long dormant volcano, Mount Scenery, at 877 metres high, the highest point in the Dutch Kingdom. The mountain is covered in a dense rain forest with a huge variety of wildlife. Lush giant ferns, brilliantly coloured wild orchids, purple-throated humming birds, lizards and so much more. The top of Mt. Scenery is often lost to sight in the clouds and the peak and upper slopes have cloud-forest environment. 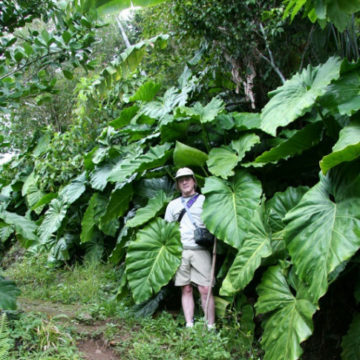 Further down the mountain, there are mountain palms, tree ferns, elephant ears, heliconia and wild plantain trees. Closer to sea level there are redwood, sea grape, white cedar, turpentine trees and cacti. There are few tourists and no theme parks or fun fairs. There are lots of ways to enjoy the island’s extraordinary natural world, the rain forest, the mountain trails and of course the ocean. The Saba Conservation Foundation (SCF), a non-profit organisation, was established in 1987, to continue that legacy of protection of this extraordinary environment. 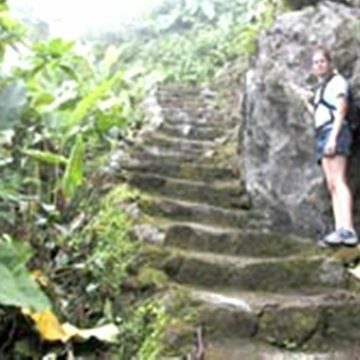 They maintain clearly marked trails for visitors to enjoy Saba’s countryside including one to the top of the mountain. 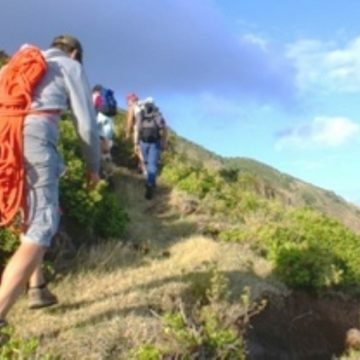 The “Unspoiled Queen of the Caribbean,” has some fantastic hikes around rain forest, tide pools, historic ruins and rich natural wonderland, often with stunning views, across the bright blue Caribbean Sea, to the neighbouring islands, St. Martin, St. Barts, St. Kitts and St. Eustatius. As well as the numerous trails through the dense vegetation of the heart of the island there are some interesting coastal walks, to see the many bird species for example. The Tide Pools of Saba are remarkable rock pools, a short hike around the coast. These pools are crevices and gullies between the ancient lava flows. The crystal-clear water gives you a fantastic view of some unusual species, various types of sea urchins, small colourful fish and sea flora. 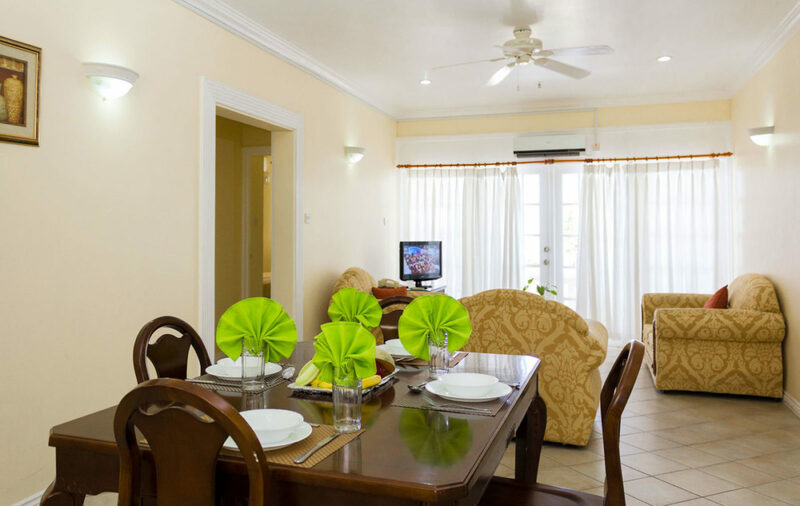 You also have dramatic views of the Caribbean Sea and the northeast side of the island. Keep one eye on the ocean, when the tide comes in, it can produce some big waves. Saba is home to over sixty species of birds, many of which are seabirds. The ocean surrounding Saba provides food for a wide variety seabirds, including Storm-petrels, Pelicans, and Gulls.Bridled Terns, Sooty Terns and Brown Booby birds breed every year in late spring on Green Island. Red Billed & White-Tailed Tropicbirds nest in crevices and ledges of the sheer cliffs while Frigate Birds and Brown Boobies swoop and dive close to the rugged coastline. Regular visitors include the Common Ground Dove, Bridled Quail Dove, Red-tailed Hawks, Thrashers, Hummingbirds and Bananaquits. Many migrating birds visit the coastline to rest and feed before continuing their journeys across the ocean. All of this diversity comes from Saba’s unique ecology. 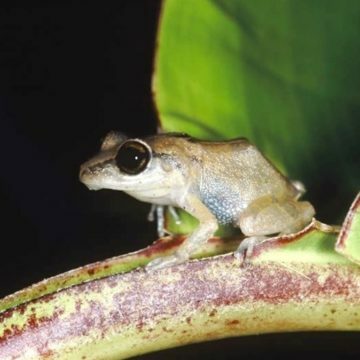 There is one species of amphibian on Saba – the Tree Frog or Johnstone’s Whistling Frog or the name I like best, the Lesser Antillean Whistling Frog. Tree frogs are nocturnal, and small, you are more likely to hear them than see them. You might be lucky enough to see them in damp areas, in plant bowl bases, under leaves or, as you might expect, in trees. 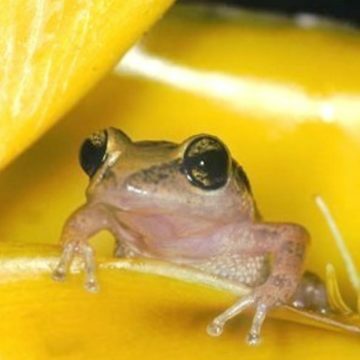 These tiny frogs hatch from the egg without passing through a tadpole stage. They eat some invertebrates but mainly insects. The name – Eleutherodactylus johnstonei – comes from Eleutheros and daktylos, both Greek words describing the ‘free finger’ of this amphibian -“johnstonei” refers to the Chief Justice of Grenada who sponsored collectors of the first specimens. 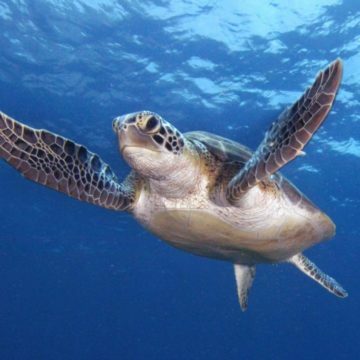 Including marine turtles and introduced species, there are 11 reptile species on Saba. 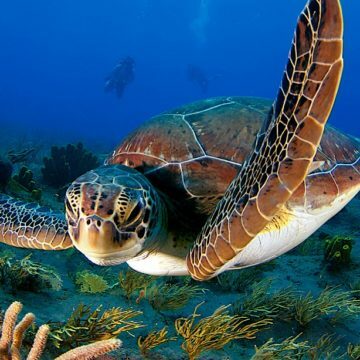 Red-Footed Tortoise, Scaly sea turtles, Loggerhead Turtle, Green Turtle, Hawksbill Turtle, Leathery sea turtles, Leatherback Turtle. Sad to say all the turtles species are endangered species. 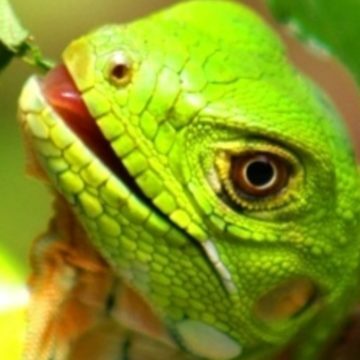 The Saban Anole (Anolis sabanus) is an indigenous species of anole lizard that is unique to the island of Saba and a common sight around the island. Males reach a length of 7cm., and are a pale ash-grey or yellow underneath, with irregular dark tan patches on their backs and head. The dewlap is pale yellow with a green or orange tint, which they inflate to assert there dominance, when mating or in territorial disputes. Females are smaller with less distinct patches and a mid-dorsal stripe. The Red-bellied Racer (Alsophis rufiventris) is a species of Colubrid snake, endemic to the islands of Saba, Sint Eustatius, Saint Kitts, and Nevis. Males have black-edged patches that develop into a dark stripe along the middle of their back. Females have a series of streaks and patches on their backs. Other common names include the Saba Racer and the Orange-bellied Racer. The non-poisonous and harmless Racer snake is a common sight along the trails and roadsides. Usually they disappear quickly into the undergrowth. This species is only found on Saba and St. Eustatius. House Gecko, Saba Least Gecko, Turnip-Tailed Gecko, Green Iguana. The Saba Least Gecko (Sphaerodactylus sabanus) is a gecko endemic to Saba, Sint Eustatius, Saint Kitts, and Nevis. Both sexes reach a maximum length of about 3cm., with a brown coloured back and an orange tint to the head. Its belly varies from white to light brown, with a white or yellow throat. Its head is covered in dark stripes or spots. 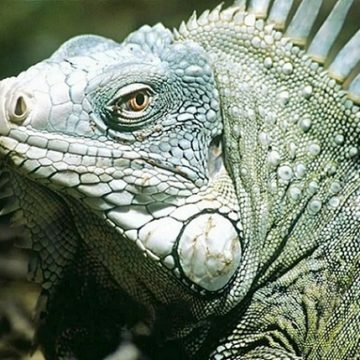 It has a dark spot on the back of its head, and its body and tail are usually covered with lighter, smaller spots. Saba has a lot of different types of plant life, most notably its wild orchids. 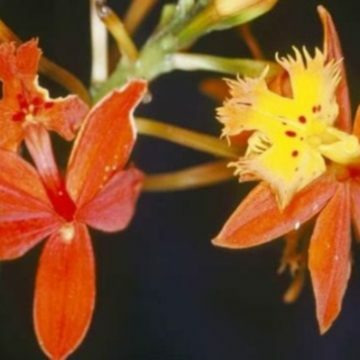 There are at least 9 different types of wild orchids on the island. 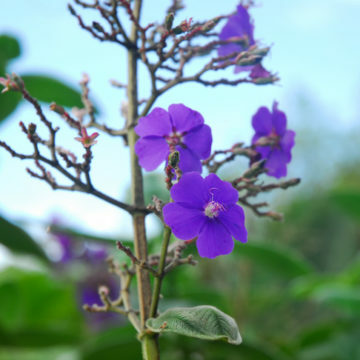 You can’t go far without seeing these spectacularly beautiful plants. 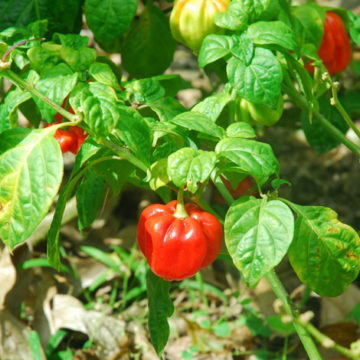 They grow along hiking trails, in gardens throughout the island, and even along the side of The Road. 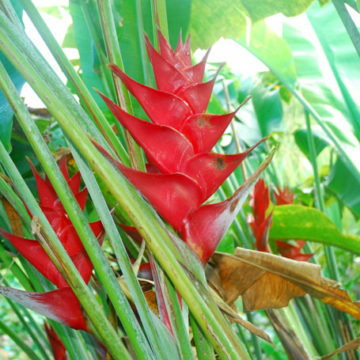 Angiosperms like: Aloe Vera, Banana, Bromeliads, Begonia, Chinese hibiscus, Coconut palm, Elephant’s Ears, Orchids, West Indian Mahogany, Red Ginger, Black-eyed Susan vine. Gymnosperms like : Monkey puzzle, Zamiaceae. Ferns like: Tree fern, Maidenhair ferns, Hard fern. Mosses like: Beard Lichen. 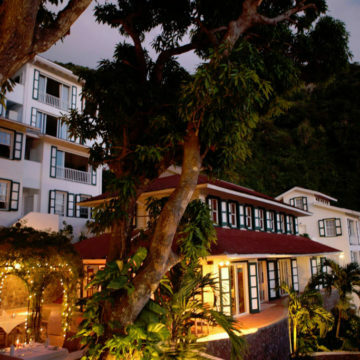 Saba is an unspoiled gem in the eastern Caribbean, covered in dense rain forest, with a pristine, natural beauty. Saba’s beauty extends below the waterline into an exciting marine environment rich in corals and marine life. Saba is a dormant volcano and rises dramatically from the ocean – depths of 300 metres and more within just 750 metres of the shore. The ocean around the island is warm and clear, 26ºC to 28ºC and visibility of 30 metres. An astonishing variety of underwater features plus varying temperatures and depths, provide a large number of different habitats for marine life to thrive. 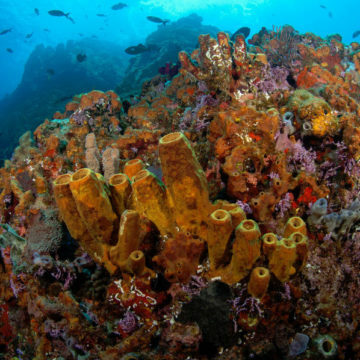 Colourful sponges and coral, small “reef” creatures and some of the larger, ocean-roaming species. Saba has a unique underwater world. Lava tunnels and hot springs are evidence of the dramatic birth of the island as a volcano. The small leeward side of the island has wonderful spur and groove lava formations as well as sheer walls. Saba has sheer underwater cliffs and pinnacles – the peaks of underwater mountains – rising up form the deep to within just 20 metres of the surface – a spectacular underwater scene. Fascinating and powerfully impressive as natural wonders in themselves but, along with the other dramatic lava formations, they provide a varied range of habitats for a healthy and very diverse marine life. Saba faces the Caribbean Sea on one coast and the Atlantic Ocean on the other. The Caribbean Sea tends to be warmer water and is well known for the diversity of marine life, small reef dwelling creatures and colourful tropical fish, huge sponges as well as some of natures more fascinating species like octopus and rays. The other side of the island faces the Atlantic, and is a couple of degrees cooler – enough to provide another special habitat. This side of the island has currents which bring nutrients from the open ocean, attracting larger, ocean roaming creatures, rarely seen elsewhere. Turtles, sharks and rays and hammerheads ! Recent sightings in Saban waters include : long-lured frogfish, orange seahorse, manta rays, pipe horse web burrfish, spotted eagle ray- sergeant major fish, spotted drum, french grunt, blue-striped grunts, Southern stingrays, octopus, groupers, snappers, barracuda, and jacks. Special mention must be made of the variety of sharks you will find here – Hammerheads, White tips, Caribbean reef sharks, black tips, reef and bull sharks are regularly seen cruising the ocean around Saba. 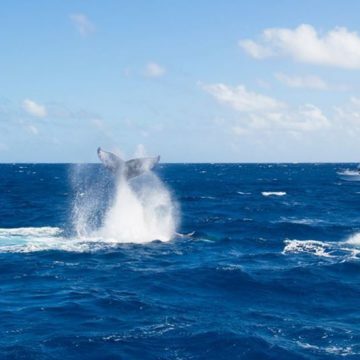 Some lucky divers and snorkellers may get a chance to swim with a humpback whale, manta rays, hammerheads or whale sharks. The ocean, with its many and varied underwater features, clear water and diverse marine life, gives divers and snorkellers a unique and exciting experience – a chance to see marine life they will not see elsewhere. The conditions here are easy and relaxed, no queues or crowds here – in or out of the water. 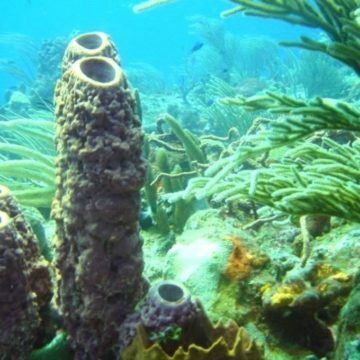 An underwater mountain with some of the richest diversity of marine life in the Caribbean has been found by scientists. During a two-week dive researchers discovered scores more species of fish than previously known in the region and vast beds of “seaweed cities”. The find was made in the Saba Bank Atoll, a coral-crowned seamount, 250km south-east of Puerto Rico in the Netherlands Antilles (Dutch Caribbean) . It is ranked as the third largest atoll in the world and has an enormous active reef. 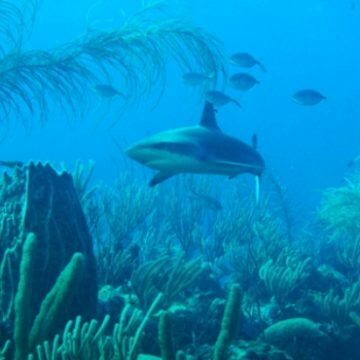 Potentially it Saba can be the keystone for protecting biodiversity in the Caribbean. Dr Michael Smith, Conservation International. Scientists chose to explore the area because although it was predicted to have high concentrations of marine life, only a small number of species had been reported. During the dives, the researchers counted a total of 200 species of fish, over 150 more than previously known. Among their find were two new species of fish, both gobies, which have the distinctive feature of fused pelvic fins on the underside of their body which forms a sucker. “Many gobies live in the canals inside sponges, so we take samples out of sponges, and open the canals up to search for the small fish that can be in there,” explained Dr Smith, a scientist on the expedition from Conservation International. “When we did that, we found quite an extraordinary one. It’s still known from a single specimen, and it is so very, very distinctive that it is probably a new genus.” The sighting of vast and luxurious seaweed beds were also astonishing, with at least 12 new species of algae discovered. 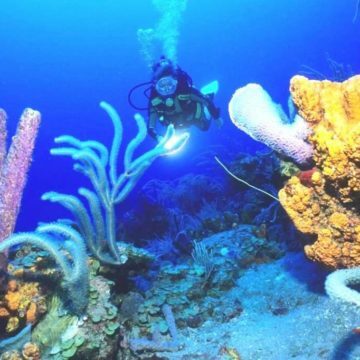 Dr Mark Littler, a marine botanist at the Smithsonian Institution’s Museum of Natural History and a diver on the expedition, declared the Saba Bank the richest area for seaweeds in the Caribbean. Seaweeds form the base of the food chain in coral reefs, from which the rest of biodiversity depends. “When we add everything together – the species of new fish, the dozen new species of algae – that means during the time we were there we discovered a new species every day. That’s pretty exciting,” said Dr Smith. Saba Marine Park (“SMP”) was established in 1987 – which introduced strict regulations for the conservation of the environment – based on the Bonaire Marine Park model. 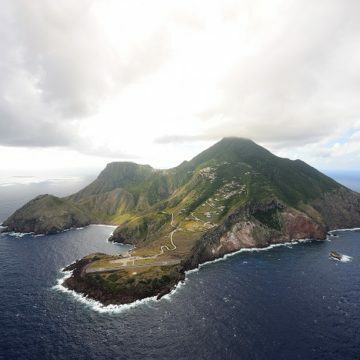 Saba’s Marine Park has received several awards and remains the only park of its kind in the world to be completely self-sufficient in its operation. The park surrounds the entire island and covers the waters and seabed from the high water mark down to a depth of 200 feet, as well as offshore sea mounts. The introduction of strict controls, and the efforts of locals and divers, has managed to protect and preserve the pristine, fragile environment. The design of the park and its zoning was a collaboration between the dive shops, the government and Sabans, including the fishermen and due to this protection Saba’s reefs are pristine. Annual scientific surveys indicate that fish density, variety and size are increasing and the growing number of shark sightings is clear evidence of this. Saba’s ocean contains spectacular reefs and walls and the island’s pinnacles – the summits of underwater mountains – are truly breathtaking. Third Encounter, Twilight Zone, Outer Limits and Shark Shoals rise dramatically from the depths of the ocean to within 20 metres of the surface. Large sea fans and huge, colourful sponges make the pinnacles a fantastic sight. Man O’ War Shoals and Diamond Rock are also classified as pinnacles but with sandy bottoms between 20m and 25m. 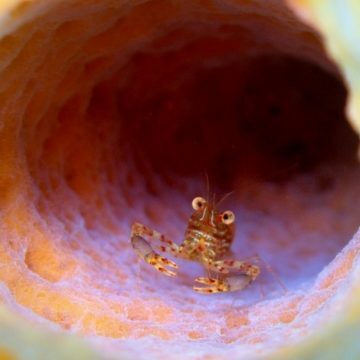 Although the larger ocean roaming creatures are not as frequent here there are many nooks and crannies that are home to every imaginable species. Schools of blue tangs, big eyes and juvenile barracuda patrol these areas. The dark volcanic sand around these sites is home to many species like flying gurnards, batfish, hard working sand tile fish and jawfish. These sites are prime examples of the healthy reefs and marine life around this special island. A series of patch reefs around the shoreline are shelter for many juvenile creatures – Morays eels, sharp-tail eels, gold spotted eels and the less common spotted snake eel. In the ocean around Ladder Bay volcanic lava flow has created a natural labyrinth of spur and groove formations. You can place your hands into the yellow sulphur coloured sand and feel the warmth of the dormant volcano. 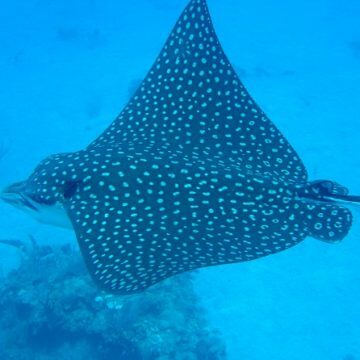 Nurse sharks, turtles, mated white spotted filefish and even the occasional tarpon are some of the larger animals you may encounter on the leeward coast. The sea grass on the perimeter of the reef provides sustenance for Saba’s healthy sea turtle population, and spotted eagle rays or seahorses. In the area around Tent Bay, on the sandy top of the reef you will see hundreds of garden eels, razor fish and southern stingrays. Colourful molluscs, large barrel and drooping sponges and yellow cup corals are a wonderfully colourful backdrop while sergeant majors, queen angelfish, french angelfish, black margates, frogfish and dog snappers swim past. Octopuses are a common sight here. On the Windwardside there are lots of volcanic coral encrusted boulders and coral reefs. The white sand bottoms, and calm water, offer yet another, different habitat to marine life like elkhorn forests, large plate and mushroom shaped star corals, brain corals, frogfish and seasonal juvenile activity. Precious things come in small packages – and Saba proves the point. 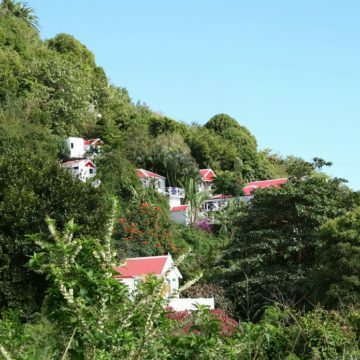 Saba, in the eastern Caribbean Sea, is the smallest island of the Netherlands Antilles and yet the dormant volcano that dominates the island, Mount Scenery at 888 metres, is the highest point of the Kingdom of the Netherlands. Saba is 170 miles east of Puerto Rico and 30 miles south of St. Martin/Sint Maarten. 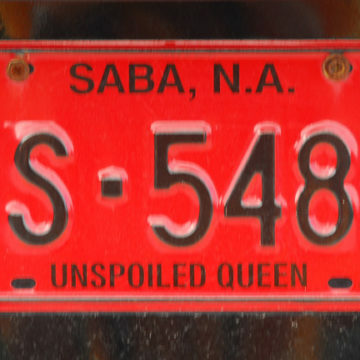 Saba is referred to as the “Unspoiled Queen”. Covered in dense rain forest, the island has a natural beauty which is virtually untouched. The island has many trails for visitors to explore the interesting flora and fauna. Saba’s striking natural beauty extends below the waterline into an exciting marine environment rich in corals and marine life. 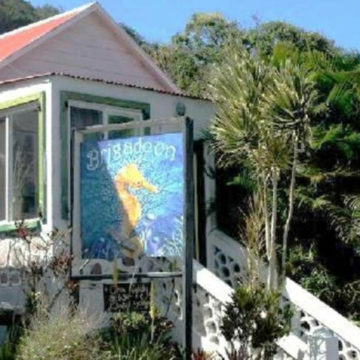 Saba is definitely off the beaten track and diving is relatively new to the island. 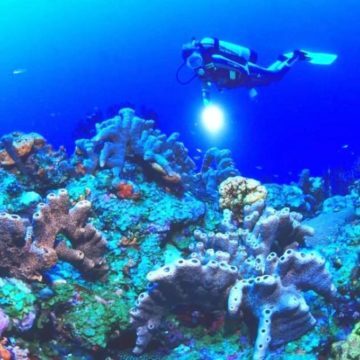 It is, therefore, an “undiscovered” diving destination for many. Saba has an almost unique combination of features that will take your breath away and is rapidly becoming recognised as one of the foremost diving destinations in the world. Saba has the Best Of Both (Underwater) Worlds. One coast faces the Caribbean Sea the other the Atlantic Ocean. Currents from the open ocean enrich Sabaís coastal waters, supporting a thriving, healthy marine life. 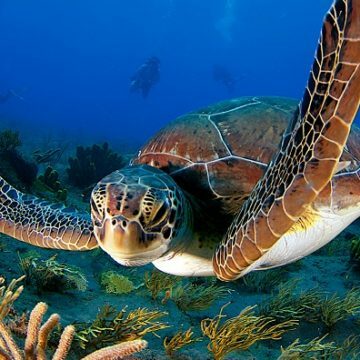 The Caribbean Sea is famous for its diversity of marine life – small reef dwelling creatures and colourful tropical fish, huge sponges as well as species like octopus and rays. The other side of the island faces the open Atlantic, yet another special habitat, for much larger ocean roaming creatures, just a few minutes boat ride from shore. Saba is close to St. Martin, and both islands are known for the “bigger stuff”, rarely seen elsewhere, rays and sharks, in particular, hammerheads. The island is a dormant volcano rising steeply from the ocean and depths of over 300 metres are within 750 metres of the shore. Warm, clear, deep water and a variety of underwater features, produces a range of habitats which naturally means a huge diversity of marine life – close to shore. Labyrinths of coral arches, swim throughs, lava tunnels, sheer cliffs, apparently endless walls and hot springs are all evidence of the island’s dramatic birth as a volcano. Elkhorn forests, Black coral, large Plate corals, Star corals and Brain corals encrust the walls and volcanic rocks. This amazing scenery forms a rich tapestry with huge, brightly coloured barrel sponges, Elephant ear sponges, yellow cup corals and large sea fans. The sea grass on the perimeter of the reef provides nourishment for Saba’s healthy turtle population, spotted eagle rays and seahorses. Not just spectacular marine scenery, but exciting opportunities to explore. Formations like Tent Reef, an extended rock ledge in just 4 metres of water, becoming progressively deeper and eventually a sheer wall. 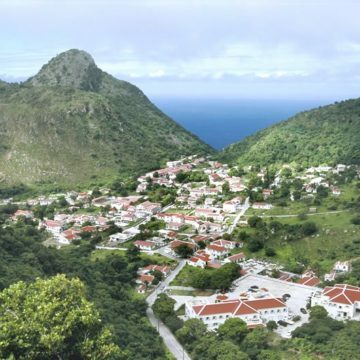 Saba is famous for its pinnacles, the peaks of underwater mountains just 25 metres down. 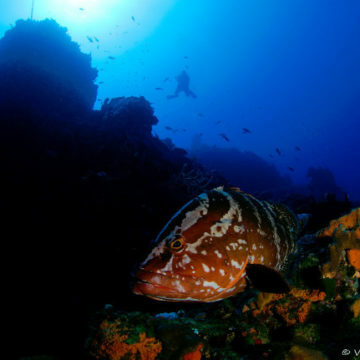 The pinnacles are a special feature of at least 5 dive sites, breathtaking scenes, a special thrill for all divers. The small leeward side has wonderful rolling spur and groove lava formations in shallow water, yet another habitat for more marine life and opportunities for easy shallow dives. Photographers love the variety of features and marine life. The shallow water allows lots of natural light and the absence of serious currents makes the process a lot easier. There are many photographic specialists on island and some run photographic courses. Divers will find a variety of diving conditions, fascinating geographical features and an exciting diversity of marine life. Divers, and snorkellers, of all levels will enjoy this wonderful marine world. The close-to-shore sites offer interesting and extremely varied diving, while the offshore dives will leave you speechless. 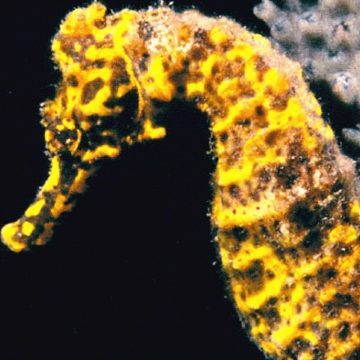 Some of the creatures you are likely to encounter; Long-Lured Frogfish, Orange Seahorse, Manta Rays, Spotted Eagle Ray, Sergeant Majors, Spotted Drums, French Grunts, Blue-Striped Grunts, Southern Stingrays, Octopus, Groupers, large Snappers, Barracuda, Jacks, Garden Eels, Razorfish, Blue Tangs, Parrotfish, Black Durgeon, Squid, Dolphin, Morays Eels, Gold Spotted Eels, Spotted Snake Eels, Flying Gurnards, Batfish, Sand Tile Fish, Jawfish, French Angelfish, Black Margates, White Spotted Filefish and Tarpon. Saba has an exceptional variety of sharks – Hammerheads, White tips, Caribbean reef sharks, Nurse sharks, Black tips, Reef and Bull sharks are all regularly seen. Some lucky divers and snorkellers may see a rare Tiger shark or Whale shark and get a chance to swim with a Manta ray, or a Humpback whale. The island is undeveloped, no mass tourism, quiet, easy and relaxed – no queues or crowds here. Due to the volcanic shoreline diving is from boats. Saba is only 13 square kilometres – 5 square miles. The 30 dive sites are close to shore, all less than 20 minutes boat ride and your accommodation can’t be far from the ocean. 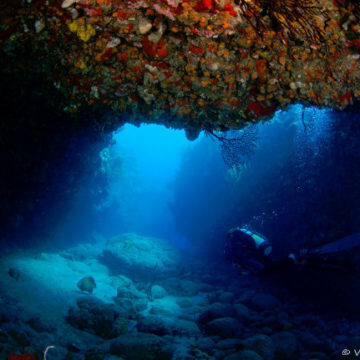 Although there is some very deep water not too far from shore, most dives are in depths of between 8 and 40 metres. There are several shallow dive sites around the shoreline, between 4 and 26 metres, comfortable diving and snorkelling. 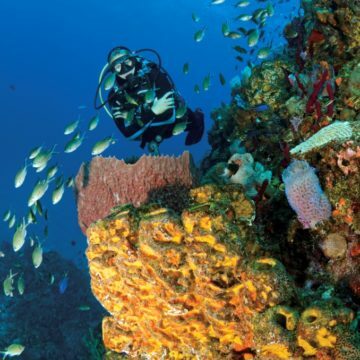 Divers of all capabilities can enjoy the diving on Saba. On the Caribbean coasts, south and west, there is little or no current. On the open ocean coast there is some current and some nice drift dives – and some larger creatures. The custom dive boats take small groups each morning, usually 6 to 8 divers and snorkellers, so it’s an easy schedule and a relaxed diving experience. 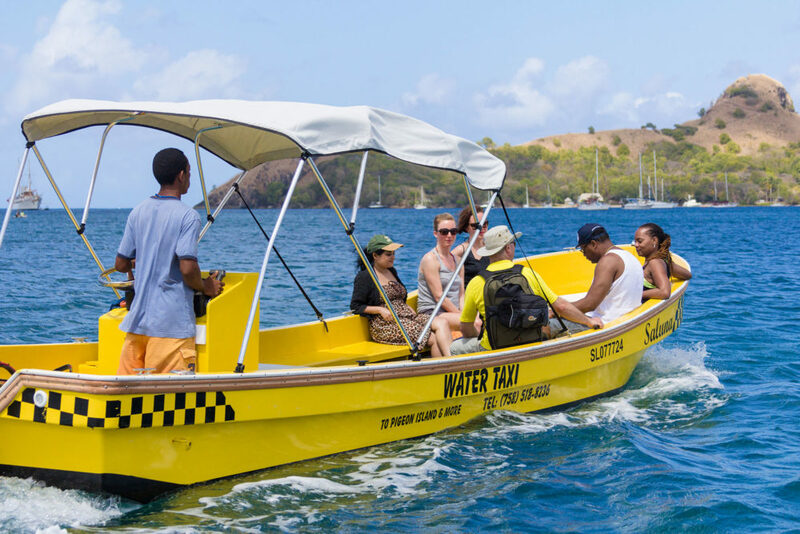 The boats are happy to take snorkellers – and the crystal clear water gives snorkellers a wonderful opportunity to see marine life they will not see elsewhere. The boats stay with the group throughout. There are plenty of sites particularly recommended for snorkellers. At most sites there will be just you and a few (new) friends – very relaxed and comfortable. As these are small groups, availability is limited. 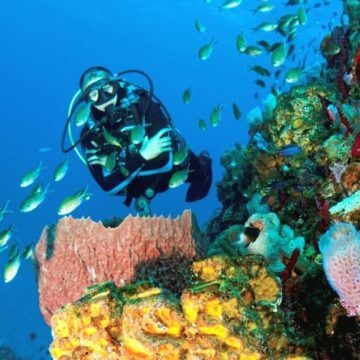 Any diving you wish to do should be booked before your arrival on island. Ocean water temperature ranges from 26ºC to 28ºC all year. A 3mm shortie is usually sufficient although the open ocean coast can be a little cooler. The visibility underwater is an astonishing 30 to 40 metres. Diving is rarely disrupted by weather. The weather is almost always warm and sunny. The air temperature ranges from 26ºC to 30ºC with a cool breeze, very comfortable conditions. Saba is a tropical island and there are no big seasonal changes in the weather, although there is a windy/rainy season October to December. Short tropical downpours, then warm and sunny again. The fantastic diving on Saba has only recently been “discovered” – scuba cylinders first arrived on Saba in 1981. 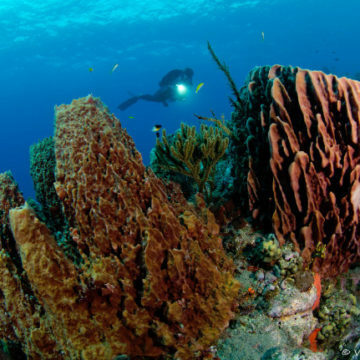 The Saba Marine Park (“SMP”) was established in 1987 – which introduced strict regulations for the conservation of the environment – based on the Bonaire Marine Park model. Strict regulation, including permanent mooring sites, has protected this pristine, delicate environment. 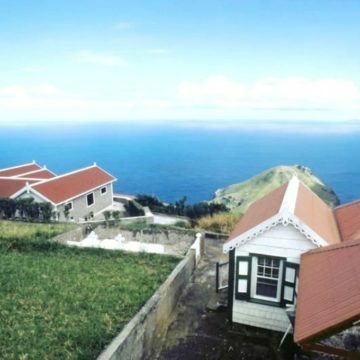 Saba’s Marine Park has received several awards and remains the only park of its kind in the world to be completely self-sufficient in its operation. The park surrounds the entire island and covers the waters and seabed from the high water mark down to a depth of 60 metres, including the offshore sea mounts. 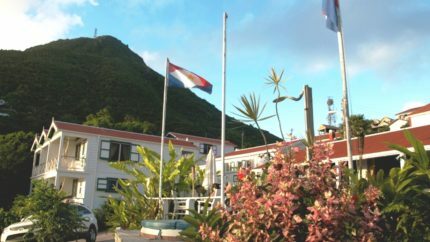 The Dutch navy donated a recompression chamber, administered by the Saba Marine Park and operated by a staff of specially trained volunteers. 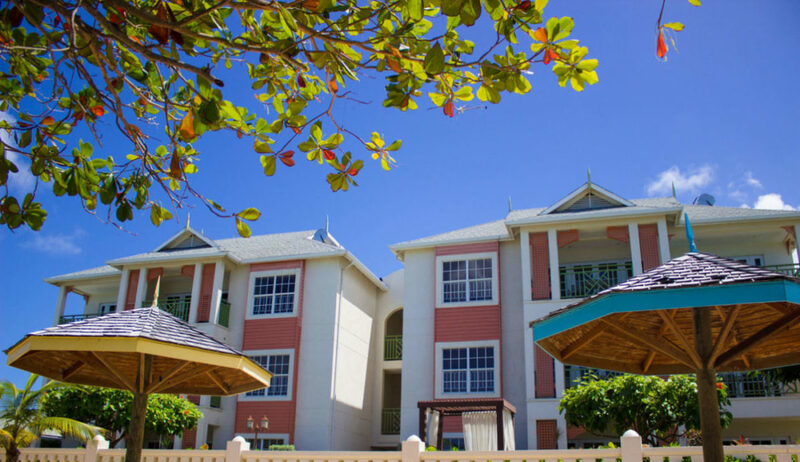 It has been operating since 1980 and serves the Eastern Caribbean region. A.M. Edwards Medical Center is a modern centre providing health care on the island. 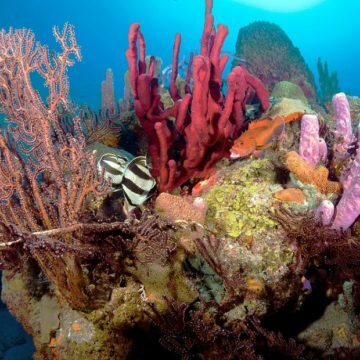 An underwater mountain with some of the richest diversity of marine life in the Caribbean has been found by scientists. Researchers discovered scores more species of fish than previously known in the region and vast beds of “seaweed cities”. The find was made in the Saba Bank Atoll, the third largest atoll in the world with an enormous, active reef. Researchers counted a total of 200 species of fish. Vast seaweed beds, with at least 12 new species of algae, were discovered. 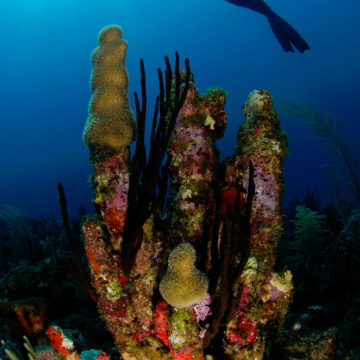 Dr Mark Littler, a marine botanist at the Smithsonian Institution’s Museum of Natural History and a diver on the expedition, declared the Saba Bank the richest area for seaweeds in the Caribbean. Seaweeds form the base of the food chain in coral reefs on which the biodiversity depends. We are an ATOL bonded, diving holiday specialist for Saba. We work closely with the dive centres on Saba who have everything divers and snorkellers might need. They offer boat diving, guided dives, night dives, equipment for sale or hire and instruction courses for all levels. We tailor-make holiday itineraries, which can include all your diving requirements, to ensure you get the best from your diving holiday. We know how the diving works and have prices lower than you would pay on island. On a small island, services like diving, instruction courses, excursions, vehicle hire etc., get booked up quickly. It is important to reserve any services you may want for your holiday, before you arrive on Saba. Booking with us saves you money and ensures those services are available to you when you arrive on island, avoiding any disappointment. Those services then become part of your ATOL protected holiday itinerary. We have a very close, and friendly, working relationship with the dive centres on Saba. They offer equipment for sale or hire and a range of instruction courses – from a first “try dive” to professional ratings. We offer a range of courses, boat diving packages and excursions – tailored to your personal diving itinerary. These dive centres are small scale – courses and boats can get booked very quickly. Booking in advance is strongly recommended – to be sure you get precisely what you want – when you arrive. Pre-booking your diving itinerary leaves nothing to chance for your precious time on the island. Most diving is from boats – and it’s a short trip to the dive sites. Saba is a small volcanic island – it gets deep pretty quick – so the dive sites are close to shore. Snorkellers can also join the boats. Please note – boats and excursions can get sold out very easily. Booking before you arrive is strongly recommended. We can book a full range of dive courses – from basic training for learner divers through to professional ratings, such as Dive Master. Instruction is available in several languages. The length of the course may vary according to the diver’s ability. Please note: Saba dive centres train to the highest standards – but they are small. Good for personal service – vital for training courses. BUT instructors may not always be available. It is important to book courses in advance to be sure you do not waste valuable holiday/diving time. 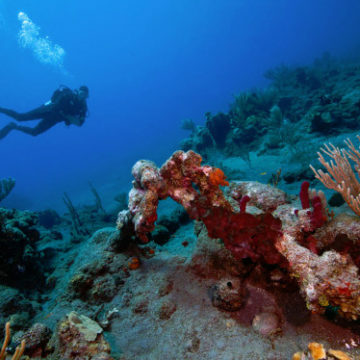 Additional Discover Scuba Dives – additional ocean dives guided by a dive professional. Scuba Review – This is a 1/2 day refresher course and includes an ocean dive. Open Water Certification – This 4-5 day course includes classroom sessions, confined water and 4 ocean dives. A certified PADI Open Water diver can dive with a buddy, unsupervised, to a depth of 18 m.
Open Water Referral Course – This is a 2 day course for those who have completed the theory and pool work of the Open Water Course. Pass the theory and pool work module of your Open Water Course in the UK and complete the open water dives in the warm, calm, clear waters of the Caribbean. Advanced Diver – This is a 2 day course – a continuation of the PADI Open Water Diver course and involves a small amount of classroom work and 5 ocean dives. Core dives are Deep and Navigation, other dives can be chosen from speciality courses that interest you. Students can focus more on their interests and can gain extra knowledge in the different aspects of diving. Minimum Age: 15 (Junior 12). Rescue Diver – 3-4 day course covering problem prevention, self rescue and 12 rescue scenarios. (Prerequisites: AOW & EFR certification). Dive Master Course – This Professional Training Course includes Diving theory, Physics, Physiology, Equipment and Environment, confined water training and open water sessions. (Prerequisites: Rescue Diver, Medic First Aid, 20 logged dives). Minimum Age 18. The first step towards your instructor certification. Once qualified you are able to supervise dive activities and assist instructors with student divers. Length of the course varies with student entry level. There are a range of speciality PADI courses also available. There are several courses and activities to get kids interested in diving. Bubble Maker is an introductory course for kids aged 8 and above, during which they get acquainted with real scuba diving. Under close supervision of an instructor they will learn the fundamentals of scuba diving in a swimming pool. Students are then given the opportunity to dive in shallow open water up to 2m deep (all equipment is provided). Kids aged 10 and older can earn their PADI Junior Open Water Diver certification. Kids can dive to 12m. At 15 young divers can pass the PADI Open Water Diver certification. They are allowed to dive to 18 m as are all qualified Open Water Divers. Children aged between 10 and 15 years who have gained their open water certificate, can only dive with a certified adult. 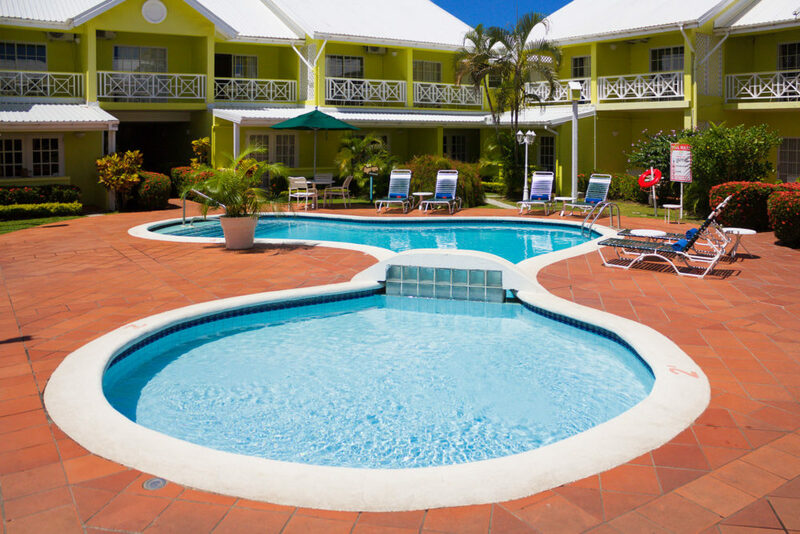 Hopefully you won’t need it ……..but Saba has a good medical facility, the A.M. Edwards Medical Center with trained medical staff. 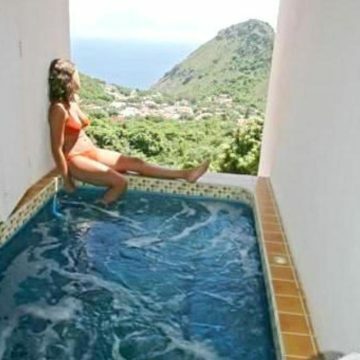 Saba has its own decompression chamber. Saba centres use American equipment – if you have DIN fittings you will need an adaptor. 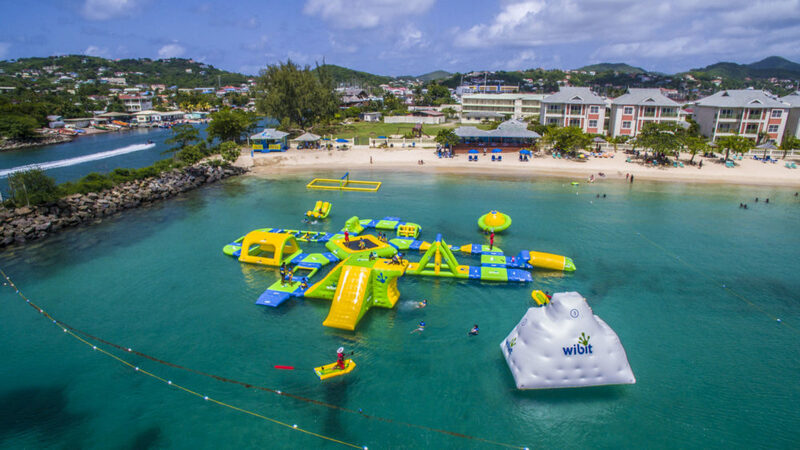 If you don’t have one – the dive centre will have one for hire. Always best to let us know before you go – to make sure everything you need is available. Saba is an unspoiled gem in the Caribbean Sea, with a pristine, natural beauty. Saba’s beauty extends below the waterline into an exciting marine environment of rock and coral formations and a diverse marine life. Saba is a dormant volcano and rises dramatically from the ocean and Saba’s unique and wonderful underwater world starts very close to shore. 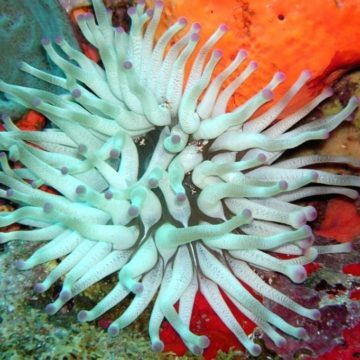 The amazing range of underwater features provide a wide variety of habitats for a diverse marine life to thrive – colourful sponges and coral, hundreds of species of small “reef” creatures and some of the larger, ocean-roaming species. Saba’s underwater world is now recognised as being unique. One of the most exciting marine environments in the world. The ocean conditions here are comfortable and the island is very relaxed – no queues or crowds. Saba is a very special place. A tiny island – off the beaten track – it offers snorkellers a new and exciting holiday destination – a chance to see marine life you will not see elsewhere. Saba faces the Caribbean Sea on one coast and the Atlantic Ocean on the other. On a small island, the influence of both gives Saba a fantastic variety of marine life. 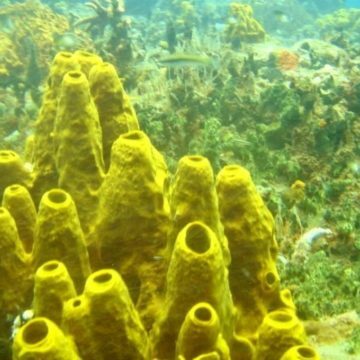 The Caribbean is well known for its diversity of marine life – huge sponges, colourful reefs, tropical fish and creatures. The Atlantic, another type of habitat, is home to much larger, ocean roaming creatures. Saba is close to St. Martin, and both islands are known for the “bigger stuff”, rarely seen elsewhere, like sharks, rays and huge shivers of hammerheads! 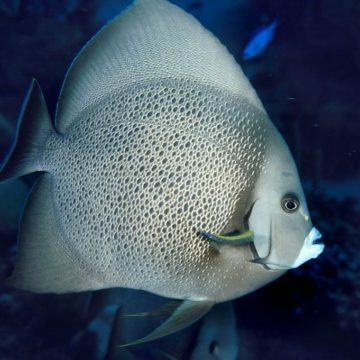 Recent sightings in Saban waters include : blue tangs, big eyes, flying gurnards, batfish, sand tile fish, jawfish, long-lured frogfish, orange seahorse, manta rays, spotted eagle rays, sergeant major fish, spotted drum, french grunt, blue-striped grunts, Southern stingrays, octopus, groupers, snappers, barracuda, and jacks. There are a variety of sharks, hammerheads, white tips, Caribbean reef sharks, black tips, reef and bull sharks regularly cruise the ocean around Saba. The sea grass on the edges of the reef provides nourishment for Saba’s sea turtle population. Large barrel and drooping sponges and yellow cup corals are a colourful backdrop while sergeant majors, queen angelfish, french angelfish, black margates, frogfish and dog snappers swim past. Huge boulders and rock formations provide a sheltered starter-home for the young of various species. Lava tunnels and hot springs are evidence of the dramatic birth of the island as a volcano. The small leeward side of the island has wonderful rolling spur and groove lava formations in shallow water – yet another habitat full of marine life, particularly colourful “reef” creatures, sponges and fans. Snorkellers will be able to see many species of marine life ñ due to the clear water and relatively shallow depth of many of these features. Saba’s underwater cliffs and pinnacles are a spectacular underwater scene. The famous Saba pinnacles are the peaks of huge underwater mountains that rise dramatically from the depths of the ocean to within 20 metres of the surface. Large sea fans and huge, colourful sponges make the pinnacles a fantastic sight. The most famous is The Eye of the Needle, close to the Third Encounter site. Powerfully impressive as natural wonders in themselves but, with the other lava formations, they provide a varied and healthy range of habitats for a large diversity of marine life. 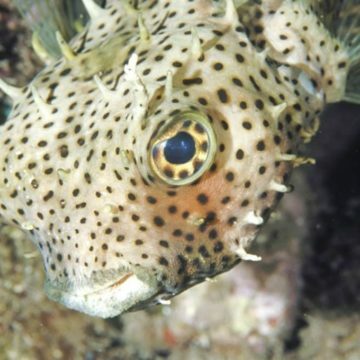 The pinnacles are a favourite of larger fish and ocean roaming species. The Atlantic coast is more dependent on weather conditions although currents are rare. Most of Saba’s underwater features are volcanic coral encrusted boulders but Greer Gut and Giles Quarter Deep Reef are true coral reefs. The white sand ocean floor gives them a very distinctive look and the marine species here are different from other sites around the island. This coast has many large hard coral formations: elkhorn forests, large plate and mushroom shaped star corals and brain corals. The ocean around the island is warm and clear, 26ºc to 28ºc most of the year and the visibility is around 30 metres. This crystal clear water allows snorkellers a great view of the spectacular underwater life, marine life you probably won’t see anywhere else in the world. Snorkelling is rarely disrupted by the weather. The weather is almost always warm and sunny – the air temperature ranges from 26ºc to 30ºc with a cooling breeze – very comfortable for Europeans. Our main advice to snorkellers is to wear a T shirt – and don’t forget to breathe ! When you see the ocean around Saba it will take your breath away. 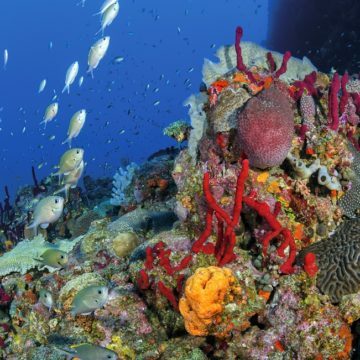 But Don’t Take Our Word For It . . . .
An underwater mountain with some of the richest diversity of marine life in the Caribbean has been found by scientists. During a two-week dive researchers discovered scores more species of fish than previously known in the region and vast beds of “seaweed cities”. The find was made in the Saba Bank Atoll, a coral-crowned seamount. It is ranked as the third largest atoll in the world and has an enormous active reef. “Potentially it Saba can be the keystone for protecting biodiversity in the Caribbean” Dr Michael Smith, Conservation International. During the dives, the researchers counted a total of 200 species of fish, over 150 more than previously known. Among their find were two new species of fish, both gobies. 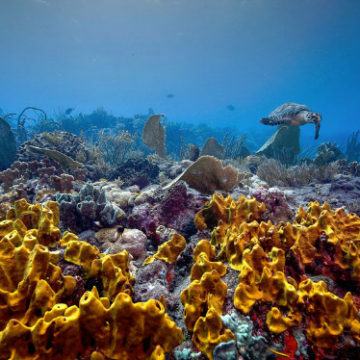 Dr Mark Littler, a marine botanist at the Smithsonian Institution’s Museum of Natural History and a diver on the expedition, declared the Saba Bank the richest area for seaweeds in the Caribbean. Seaweeds form the base of the food chain in coral reefs, from which the rest of biodiversity depends. “When we add everything together – the species of new fish, the dozen new species of algae – that means during the time we were there we discovered a new species every day. That’s pretty exciting,” said Dr Smith. 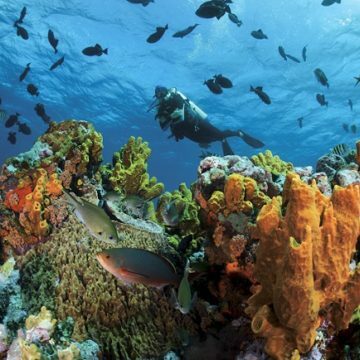 Saba Marine Park (“SMP”) was established in 1987 – which introduced strict regulations for the conservation of the environment – based on the Bonaire Marine Park model. 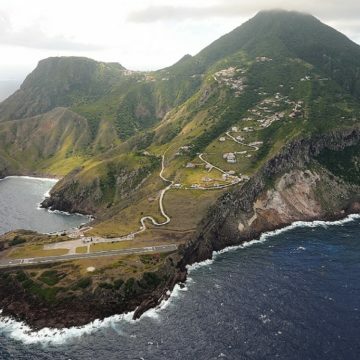 Saba’s Marine Park has received several awards and remains the only park of its kind in the world to be completely self-sufficient in its operation. The park surrounds the entire island and covers the waters and seabed from the high water mark down to a depth of 60 m, as well as offshore sea mounts. The introduction of strict controls, and the efforts of locals and divers, has managed to protect and preserve the underwater environment. 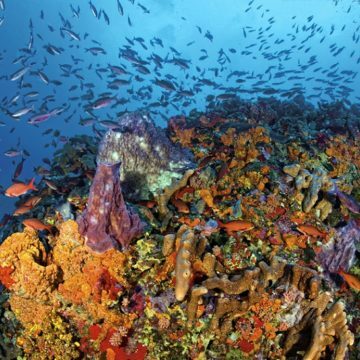 Due to this protection Saba’s reefs are pristine. Annual scientific surveys indicate that fish density, variety and size are increasing and the growing number of shark sightings is clear evidence of this. 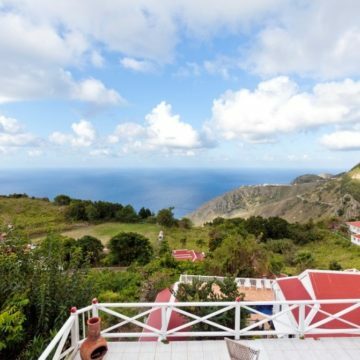 On Saba the ocean and island conditions are quiet, easy and relaxed – no queues or crowds here. Saba has no permanent beaches, consequently snorkelling is from boats. The 30 dive sites are close to shore, the farthest is no more than a 20 minute boat ride away, and the dive centres have excellent boats. Apart from the sites in deeper water or those with more challenging ocean conditions, most are suitable for snorkellers. It’s a very small island so you won’t be more than a few minutes to the boat dock. The boats take small groups each morning so it’s an easy schedule and relaxed snorkelling experience. Boat dives need to be planned and it is best to book. There are special snorkelling trips and the boats will always stay with you. 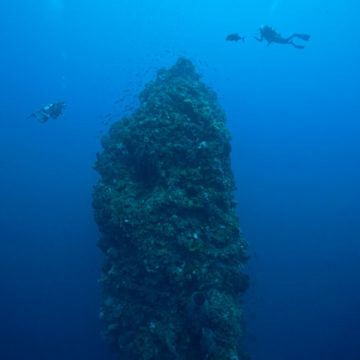 Man O’ War Shoals and Diamond Rock are classified as pinnacles with sandy bottoms between 20m and 25m. There are many nooks and crannies that are home to every imaginable species. Schools of blue tangs, big eyes and juvenile barracuda patrol these areas. The dark volcanic sand around these sites is home to species like flying gurnards, batfish, hard working sand tile fish and jawfish. These sites are excellent examples of the healthy reefs and thriving marine life around this special island. Ladder Bay. The sites here are called Custom House, Porites Point, Babylon, Ladder Labyrinth and Hot Springs. Volcanic lava flow has formed a natural maze of spur and groove formations. Nurse sharks, turtles, white spotted filefish and tarpon are common here. The sea grass on the edges of the reef provides nourishment for Saba’s sea turtle population, and you may see spotted eagle rays and seahorses. Tent Bay – on the sandy top of the reef you will see hundreds of garden eels, razor fish and southern stingrays. Colourful molluscs, large barrel and drooping sponges and yellow cup corals. Octopuses are a common sight here. Well’s Bay and Torrens Point are the most sheltered area of the coast – excellent snorkelling. A series of patch reefs, dotted with huge boulders, provide a sheltered area for the young of various species. You’ll see moray eels, sharp-tail eels, gold spotted eels and the less common spotted snake eel that hides in the sand. We work with the dive centres and hotels on the island. As an ATOL bonded tour operator we can organise the whole itinerary – flights – accommodation diving etc. 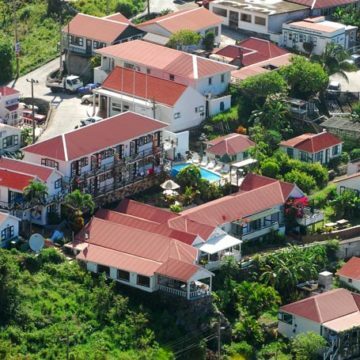 Due to its “anonymity” and lack of commercial development Saba is an unspoiled gem. If you want to take some boat trips, special courses or excursions, you should book in advance. Boat trips and excursions are in small groups and can get booked up. We can reserve any trips or excursions you might wish to enjoy whilst on Saba. 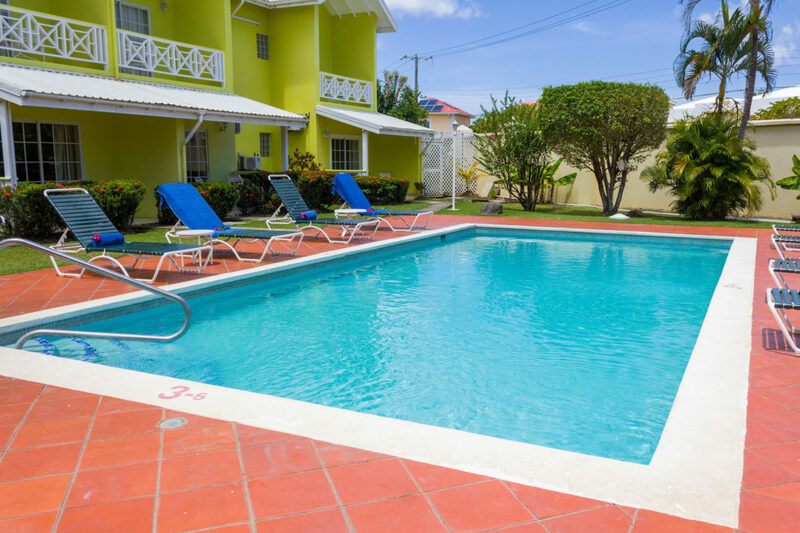 Booking your on-island services with us is a little cheaper and we can include that into your ATOL protected holiday itinerary. Saba, like the other Dutch Caribbean islands, is a relatively unknown to most people around the world. Being off the beaten track makes it an exciting new “discovery”. 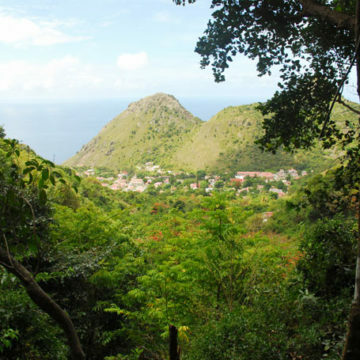 Saba has resisted commercial development to protect its heritage and natural habitats. The islanders have earned their living from the land and the ocean – and the desire to protect both is part of their heritage. 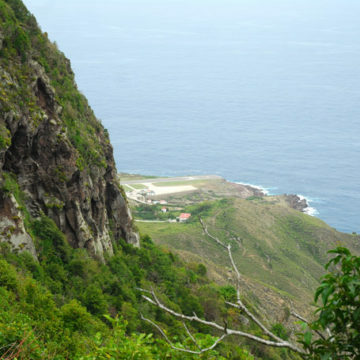 Tourism is new to Saba – the airport opened in 1963 – and protection of the natural world has ensured there are no “commercialised tourist activities”. You can enjoy the island’s natural world in peace and quiet – and at your own pace. A refreshing change from being part of a tourist package. Saba is home to over sixty species of birds, many of which are seabirds. Bridled Terns, Sooty Terns and Brown Booby birds breed every year in late spring on Green Island. Red Billed & White-Tailed Tropicbirds nest in crevices and ledges of the sheer cliffs while Frigate Birds and Brown Boobies swoop and dive close to the rugged coastline. Regular visitors include the common ground dove, Bridled quail dove, red-tailed hawks, thrashers, hummingbirds and bananaquits. The rich waters surrounding Saba are feeding grounds for a wide variety of other seabirds, including Storm-petrels, Pelicans, and Gulls. Many migrating birds visit the coastline to rest and feed before continuing their journeys across the ocean. All of this diversity comes from Saba’s unique ecology. 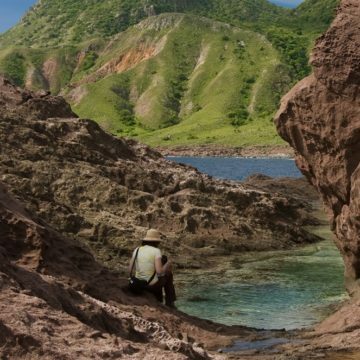 This rugged little island, an extinct volcano, with its dramatic natural features, is perfect for people who wish to explore the natural world. 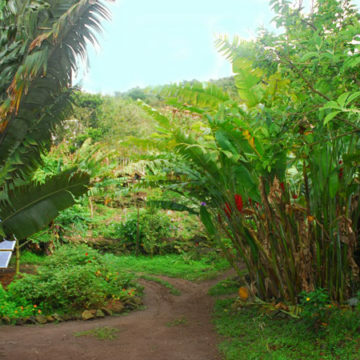 The Saba Conservation Foundation (SCF), a non-profit organisation, was established in 1987, to protect and preserve the natural and cultural heritage of the island. 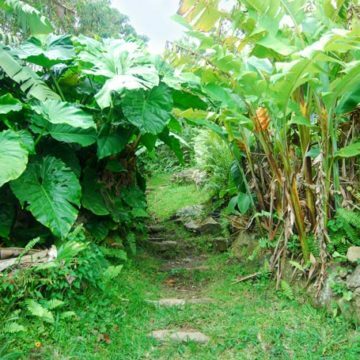 The Saba Conservation Foundation has established marked and maintained trails for visitors to enjoy Saba’s countryside. The “Unspoiled Queen of the Caribbean,” has some fantastic hikes around rain forest, tide pools, historic ruins, and rich natural wonderland with breathtaking views. A great variety of paths and trails all offering you something different. All trails are very well marked and in good condition. An excellent trail map is widely available. Saba’s looming cliffs and rock formations make it a great place for rock climbing. There is an established company providing equipment and guides if you want to take the challenge. There are half and full day adventures. Saba’s dominant feature is the impressive peak of the volcano (long dormant). Mt. Scenery is the highest point in the Dutch Kingdom at 877m – the dense rain forest can be seen through the light clouds. The mountain is covered in a dense, jungle like, rain forest with a huge variety of wildlife, lush giant ferns, brilliantly coloured wild orchids, purple-throated humming birds, lizards and so much more. The island’s vegetation varies according to altitude and rainfall leading to an interesting variation in the wildlife in each area. The top of Mt. Scenery is often lost to sight in the clouds and the peak and upper slopes have cloud-forest environment. 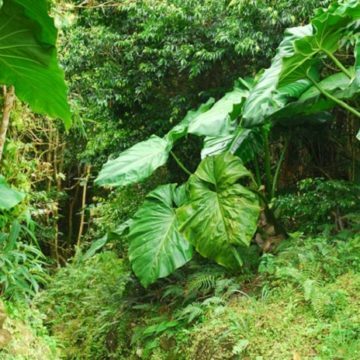 Further down the mountain, in the hill tops to the lower slopes region, there are lots of mountain palms, tree ferns, elephant ears, Heliconias and Wild plantain trees. Closer to sea level there are Redwood, Sea Grape, White Cedar, Turpentine trees and cacti. 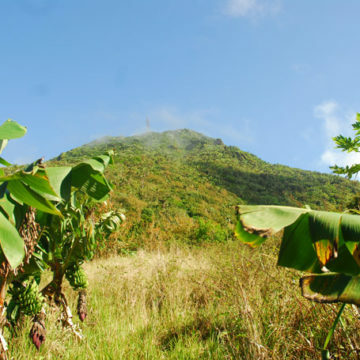 There is a hiking trail to go up the mountain that starts just outside Windwardside. It’s best to start early as the summit is shrouded in cloud by the afternoon. The hiking trails have some stunning views. 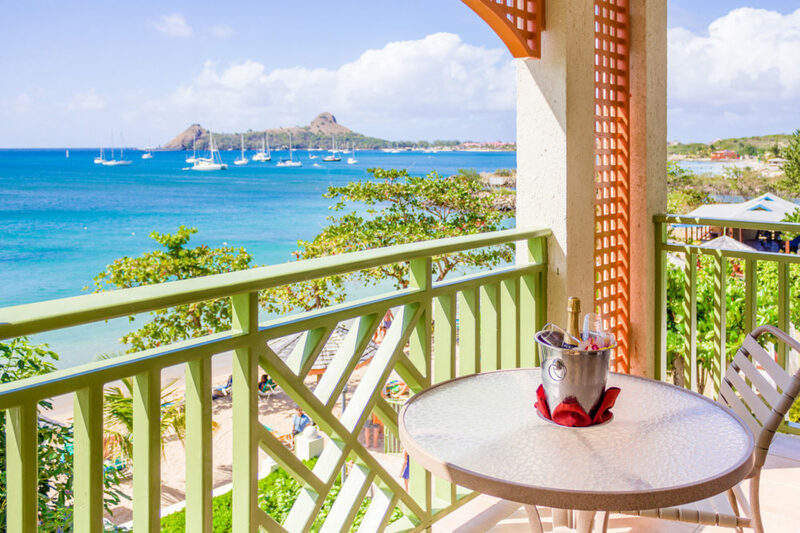 On a clear day you’ll be astonished at the beautiful view of the neighbouring small islands in the bright blue Caribbean Sea – St. Martin, St. Barts, St. Kitts, and St. Eustatius. 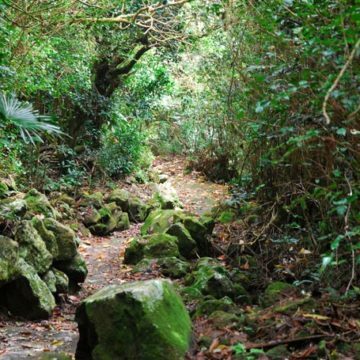 As well as numerous trails through the dense vegetation of the heart of the island there are some fascinating coastal walks, where you’ll find the remarkable tide pools of Saba, crevices and gullies between the ancient lava flows. The crystal clear water gives you a fantastic view of some unusual species, various types of sea urchins, small colourful fish and sea flora. There are some dramatic views of the Caribbean Sea and the northeast side of the island. Keep one eye on the ocean, when the tide comes in, it can produce some big waves. Wear some decent shoes – these are “proper” hikes. 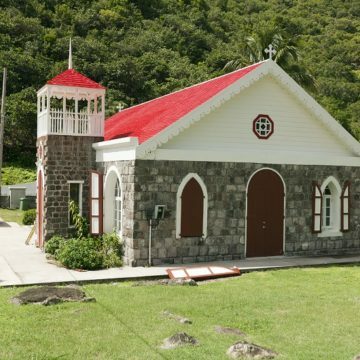 To find out more Saba’s history and culture visit the Harry L. Johnson Memorial Museum in Windwardside. The museum is open Monday to Friday from 10 a.m. to 12 p.m. and from 1 p.m. until 4 p.m. The museum used to be the home of a Saban seaman. The house is still furnished in the style of these times and has a collection of historical island relics. Without doubt – and as you might expect – the two most popular activities on the island. Saba is rapidly becoming known around the world for the staggering diversity and beauty of its underwater world. 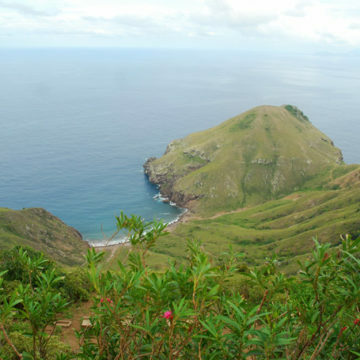 Saba is a dormant volcano that rises steeply from the ocean. Saba’s volcanic birth left hot springs, lava tunnels, huge pinnacles that rise to within 25 metres of the surface and massive rock and coral walls. 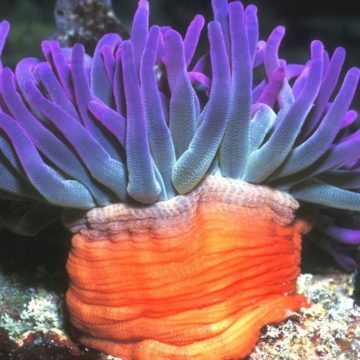 The fantastic marine life includes many species of colourful tropical fish, huge sponges and some of the “big stuff”. 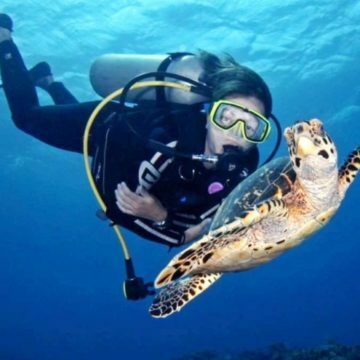 Due to the clear water conditions snorkelers also have a wonderful opportunity to see marine life they will not see elsewhere – large ocean-roaming creatures. Sightseeing on Saba is all about the dramatic, natural beauty of the island and its cultural heritage. 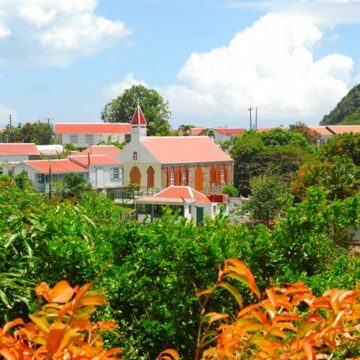 Saba is 5 square miles of unspoilt natural beauty. Mount Scenery rises steeply to almost 3,000 feet into the sky and, on a small island, that produces an exciting landscape. Saba is rich in flora and fauna, with a fantastic diversity of life, a unique natural world and some fascinating historical sites. Mt. Scenery is covered in a jungle like, rain forest with a huge variety of wildlife, lush giant ferns, brilliantly coloured wild orchids, purple-throated humming birds, lizards and much more. The vegetation changes according to altitude and rainfall leading to an interesting variation in the wildlife in each area. The top of Mt. Scenery is often lost to sight in the clouds and the peak and upper slopes have cloud-forest environment. Further down there are mountain palms, tree ferns, elephant ears. Closer to sea level there are redwood, sea grape, white cedar, turpentine trees and cacti. 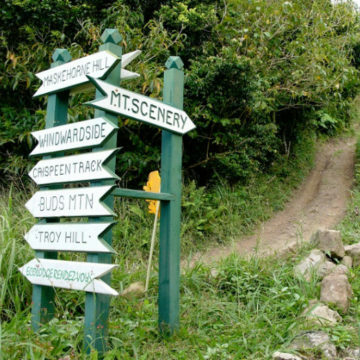 There is a hiking trail to go up the mountain that starts just outside Windwardside. It’s best to start early as the summit is shrouded in cloud by the afternoon. 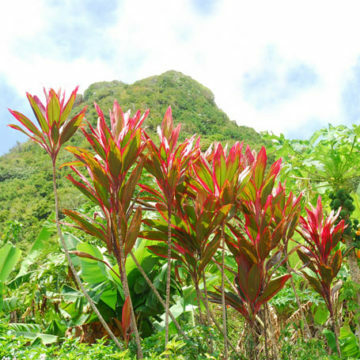 Saba has a lot of different types of plant life on the island, most notably its wild orchids. 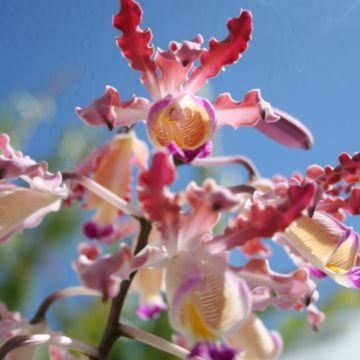 There are at least 9 different types of wild orchids on the island and you won’t go far without seeing them. They grow along hiking trails, in gardens throughout the island, and even along the side of The Road. The Road is a notable “sight”. Josephus Lambert Hassell was the engineer who, in 1943, designed and supervised the building of “the road that could not be built” – from Fort Bay to The Bottom. Over 20 years, 14 km of road was painstakingly laid by hand by locals. 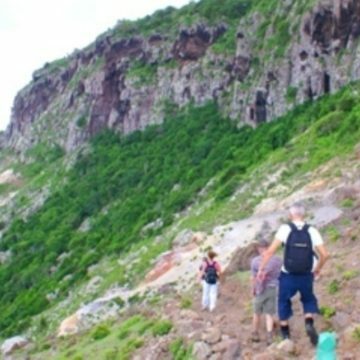 Hiking is a great way to see the historic sites and Saba’s unique beauty. 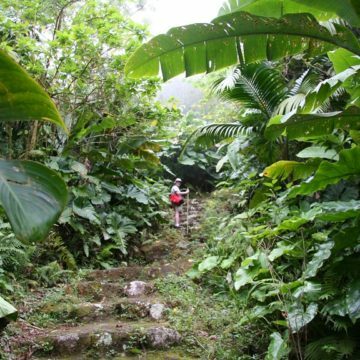 The “Unspoiled Queen of the Caribbean,” has some fantastic hikes through the rain forest which also take in the tide pools, historic ruins, caves, small villages and some magnificent views. 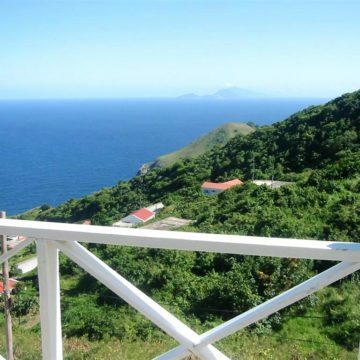 Looking out over the Caribbean Sea you will see the neighbouring islands of St. Martin, St. Barts, St. Kitts, and St. Eustatius. Some trails take you along steep cliffs rising over 100m (330ft). Each one gives you something different and something very special. 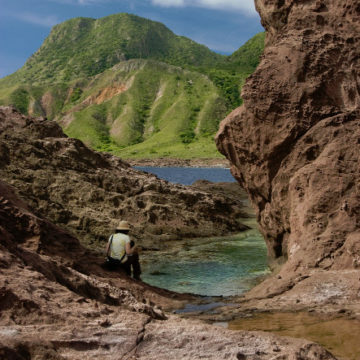 As well as numerous trails through the dense vegetation of the heart of the island there are some exciting coastal walks, where you’ll find the remarkable tide pools of Saba in crevices and gullies between the ancient lava flows. The crystal-clear water gives you a fantastic view of some unusual marine species, various types of sea urchins, small colourful fish and sea flora. There are some dramatic views of the Caribbean Sea and the northeast side of the island. Keep one eye on the ocean, when the tide comes in, it can produce some big waves. Wear some decent shoes – these are “proper” hikes. Saba’s looming cliffs and rock formations make it a great place for rock climbing. There is an established company providing equipment and guides if you want to take the challenge. There are half and full day adventures. 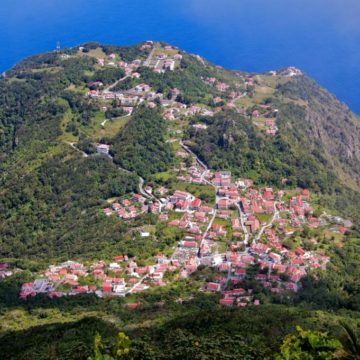 There are four small villages on Saba – Windwardside, The Bottom, Hell’s Gate and St. Johns – all small communities. Saba has fewer than 2,000 residents. It is a pleasure to stroll around these small villages and enjoy their historical heritage as shown in the picturesque house and interesting churches. 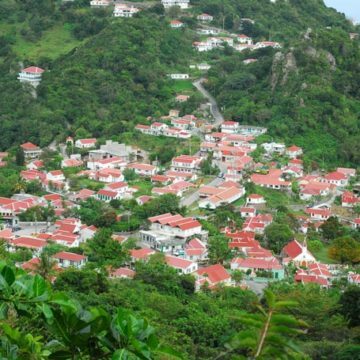 Many houses are small white buildings, perched on the green slopes, looking out over the ocean. The Bottom is the largest and is the capital of the island. The Bottom is a corruption of the Dutch word for “bowl”. Around 500 people live in the red-roofed homes of The Bottom. There are some fascinating old rustic houses here and the architecture often dates back hundreds of years. Each village has one or two impressive churches and The Bottom has the Sacred Heart, which is 100 years old, and the Wesleyan Holiness Church and Christ Church which is 200 years old. 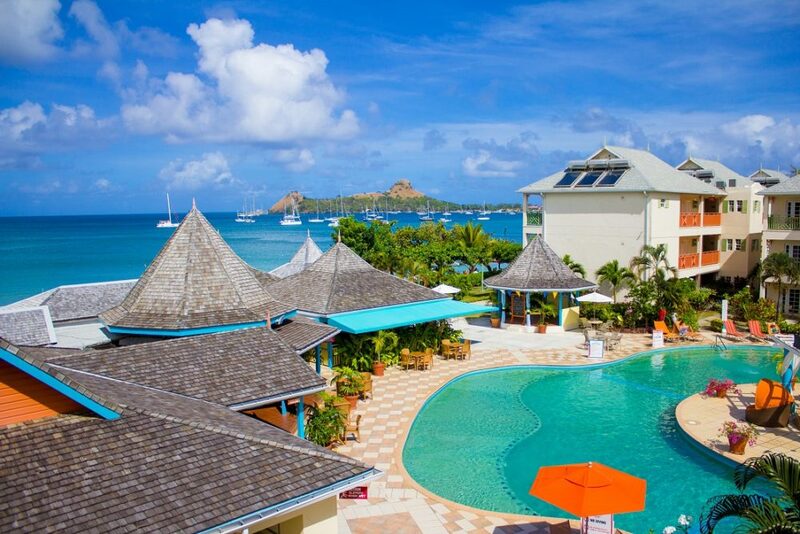 Windwardside is the second largest village, with the most shops, two banks, dive shops, restaurants and some hotels. Lots of quaint and very picturesque houses. Two fine churches – Holy Trinity, 100 years old Anglican, and Church of St. Paul’s Conversion. The hike up Mount Scenery starts on the road just outside Windwardside. The Peanut Gallery (local arts and crafts) is in Windwardside. 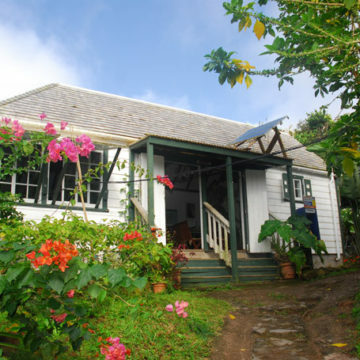 Harry L. Johnson Museum is in a 19th century sea captain’s cottage (160 years old) at the end of Park lane in the historical district of Windwardside. Exhibits include collections from the 19th and early 20th century and a collection of artefacts from the Amerindian archaeological sites around the island. 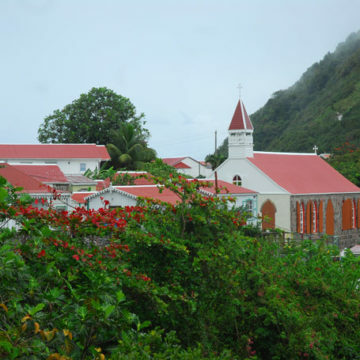 Hell’s Gate, local church leaders prefer you call it “Zion’s Hill”, has a community centre where you can buy the island’s famous Saba Lace or the potent Saba Spice rum, both produced locally. The Crispin Trail, which leads past an abandoned sulphur mine, starts here. 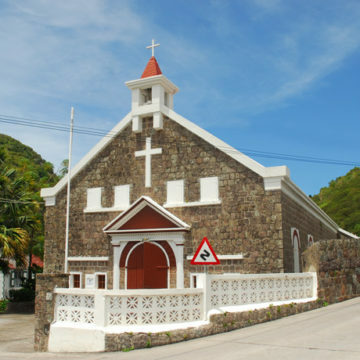 The iconic Holy Rosary Church is also in “Zion Hill”, a small, stone church which appears to be from the middle ages but was actually built in 1962. 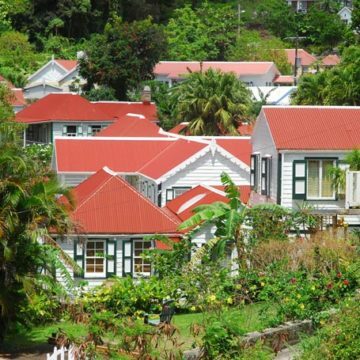 St. John’s is the smallest village and largely residential, on the road between The Bottom and Windwardside. 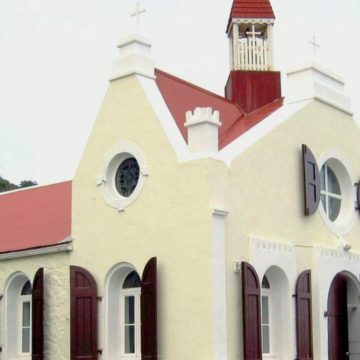 Both of the island’s schools (primary and secondary) are in St. John’s as well as a church and a couple of restaurants. Again, lots of very pretty houses and buildings. Saba’s only public swimming pool. Rocks have been placed in the cove as a barrier to the open ocean, and a man-made sandy beach has been laid, so everyone can enjoy a swim in safety. Great place to relax and enjoy the beauty of this small island as it rises above you. On weekends you might see one or two barbecues on the go, great way to meet the locals. The normally rocky shores of Well’s Bay are occasionally transformed into a stunning strip of golden sand. When the “disappearing beach” appears it’s usually empty, very beautiful and an ideal snorkelling location. Until a few decades ago, everything islanders imported had to be carried up 800 steep steps from Ladder Bay to the old Custom House in the village (The Bottom). Visitors will enjoy the challenge – and the irony – of climbing up a steep ascent to reach . . . The Bottom. Fort bay is the port, the pier is the departure point for dive boats. There are three dive shops and some restaurants. There is a “beach” at Fort Bay, where a dramatic, rocky, steep climb of 800 steps has been carved out of the rock. Saba is widely acknowledged as one of the world’s best dive destinations. The Saba National Marine Park surrounds the island, and the waters and reefs are protected to a depth of 200 feet. 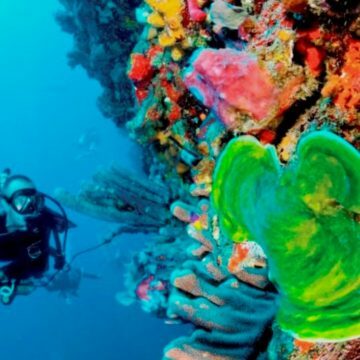 There are dozens of great dive sites, including reefs, wrecks, caves, tunnels, walls, and the Pinnacles, which are unique rock formations thrust up from the ocean floor by volcanic action. 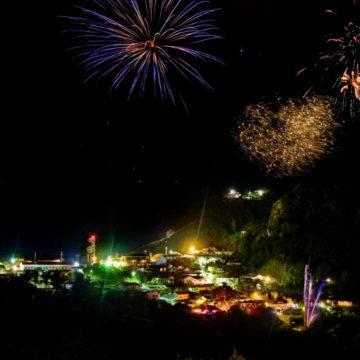 Saba’s nightlife is informal, low key and friendly, the sort of nightlife you will probably relish if you have come to enjoy the natural treasures of this small island. 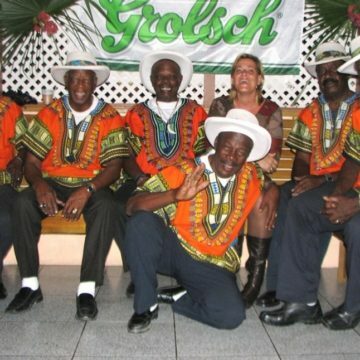 The Dutch Caribbean has a rich and varied cultural heritage, which has developed into an easy going society with a more “open” attitude to visitors, a very welcoming atmosphere. Like other Dutch Caribbean islands, there is no mass tourism and the nightlife is far more of a social activity than Europeans are used to – far more friendly and relaxed. The nightlife is centred on the hotels, restaurants and bars – live music and theme nights – all around the island – and everyone is welcome. One of the special pleasures of being on a small, safe island is that you can get out-and-about very easily and discover the various “entertainments” for yourself – without too much effort. It is a thrill turning a corner and unexpectedly finding a barbecue going strong – or a steel band entertaining people – finding something interesting and good fun to enjoy. 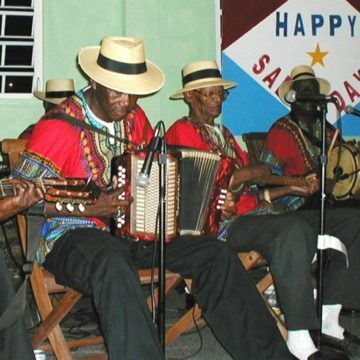 There are “special event nights” at various venues around the island – live music etc., which occur throughout the week. As they are small scale, and very informal, you can enjoy them with small groups of fellow visitors and locals. These nights include regular karaoke nights. 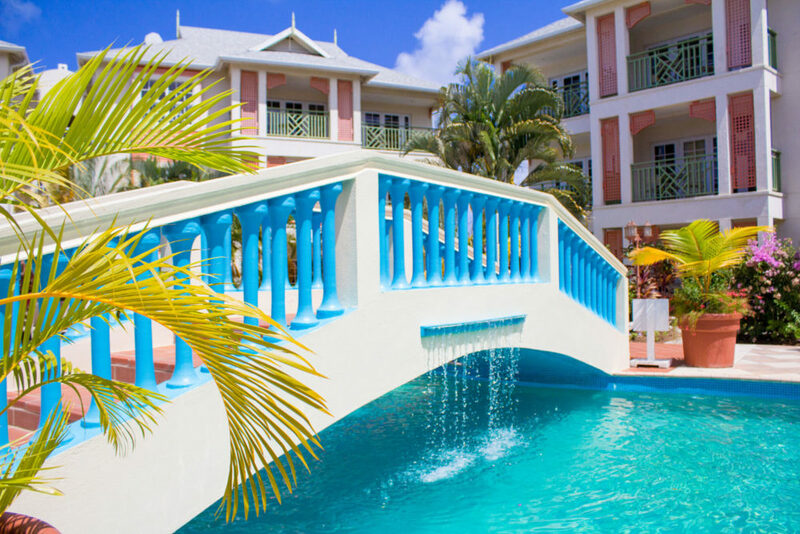 As it is such a sociable and informal setting – you might be tempted to take the plunge – and join in. Just think – you can give the Caribbean your version of “My Way”. Good fun – recommended. 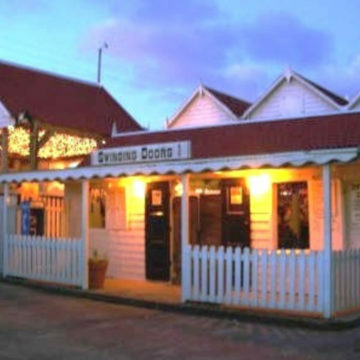 Restaurants on Saba are the focus for social life on the island. It is very refreshing change to dine out alongside local people. Not just a wonderful source of conversation and information but you feel like a guest and less like a tourist. Surprisingly there are 19 restaurants and bars on this small island. Several restaurants have won awards for food and for fine wines. Most restaurants offer regular entertainment – on various nights of the week. Each village has their own highly individual restaurants. There is very wide range of cuisine available – burgers to nouvelle cuisine – and a range of prices giving visitors a lot of choice. 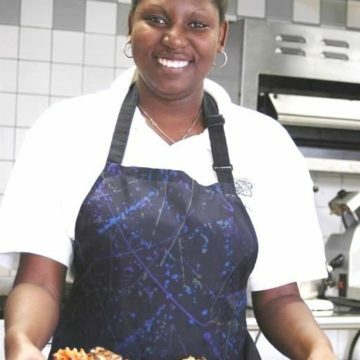 You will find international cuisine with a strong European influence available everywhere, but the special treat about being on an island like this is the authentic, “home made” Creole dishes – things we never get to eat here – and some we have never heard of ! There is also a strong Indonesian influence (Dutch colonial influence) which just adds another continent to the culinary mix. Of course the seafood ins unbelievably fresh and unlike anything we get in Europe. 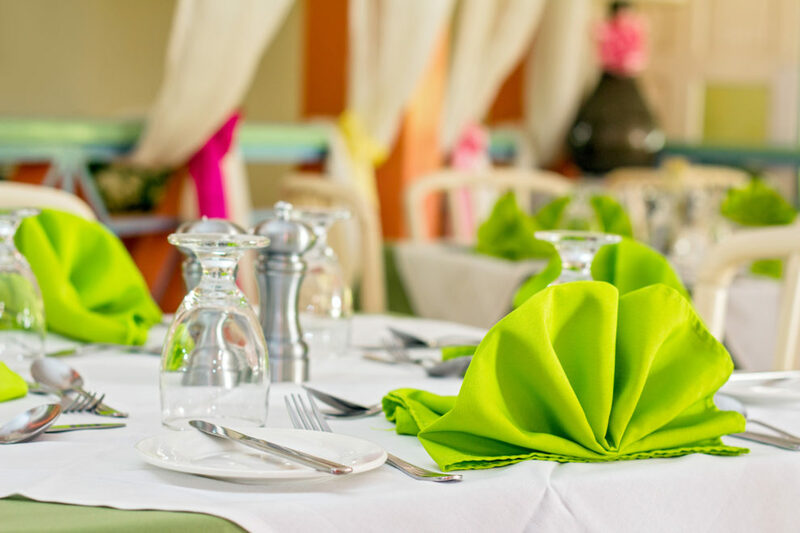 We have emphasised the relaxed and low key nature of the nightlife, but there some very high quality restaurants on the island, where you can dine a little more formally if you wish. We will send you the list of personally recommended restaurants with your booking. Let us know if you wish to reserve a table – for a special occasion or on a special day when they might be busy (Christmas for example). We have arranged a lot of “surprise” meals for birthdays, anniversaries etc. The restaurants offer another, very special, ingredient – their location. Most offer the chance to dine al fresco, under the stars, and some of the locations are spectacular. 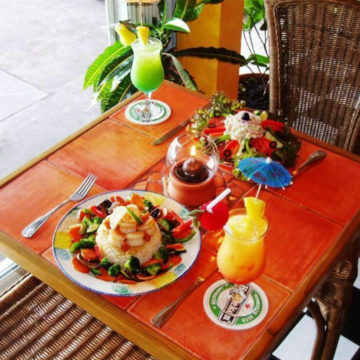 Restaurants can be 2,000 feet above the Caribbean Sea overlooking the dramatic coastline and the rugged bays. 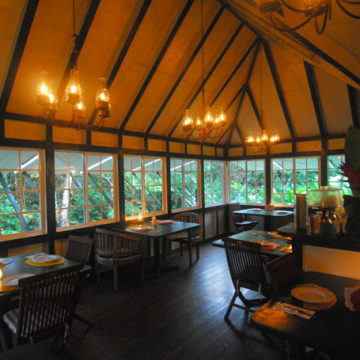 Some are deep in the rain forest – like eating in the jungle – but with a knife and fork. Although temperatures cool in the evening, for Europeans it is still warm, so eating out is a real pleasure, under the stars and with so much natural beauty around you. No irritating insects – mosquitoes are very rare. Saba’s restaurants give you an informal ambiance, a wide choice of cuisines and budget – but throw in the panoramic views and picture perfect sunsets for free. Prices for eating out, and drinking are generally similar to UK – various “special” items of food or drink, have to be imported and may seem a little pricier than in UK. But in general food and drink is very reasonable. 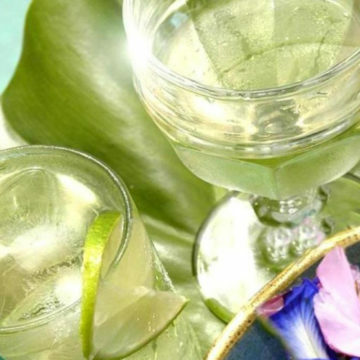 There is Latin American dancing on various nights of the week at several venues – another of those hidden gems you’ll find. One or two venues – literally one or two – stay open late. You can salsa until the small hours late if you wish. Saba faces the Caribbean Sea on one coast and the Atlantic Ocean on the other. The Caribbean Sea tends to be warmer water and is well known for the diversity of marine life, small reef dwelling creatures and colourful tropical fish, huge sponges as well as some of natures more fascinating species, like octopus and rays. The other side of the island faces the open Atlantic, and is a couple of degrees cooler, enough to provide another special habitat. This side of the island has currents which bring nutrients from the open ocean, attracting larger, ocean roaming creatures, rarely seen elsewhere. Turtles, sharks and rays and hammerheads ! Flights to Saba are with AirFrance/KLM – the only major airline to fly from Europe to the Dutch Caribbean islands. Air France/KLM are one of the best airlines in the world, you can relax and enjoy your well-deserved holiday. AirFrance/KLM gives you a huge choice of departure points in the UK ñ flying from over 15 airports – no long trek to a “central” airport, a shorter journey and far less hassle. It might also be possible to avoid airport parking fees if departing from an airport closer to home. The service on board KLM is excellent – meals and drinks are free of charge – luggage allowances are higher and seats are more spacious than the usual “holiday” charter flights. Flights to St. Martin / Sint Maarten are via Paris (Charles de Gaulle) – the flight from the UK to Paris takes around one hour. There are several connecting flights each day from 15 UK airports. The check-in time in the UK is just one hour – and the transfer is quick and easy. The combination of a short check-in and a local UK airport will mean that you save a lot of time and hassle starting your journey. It may seem counter-intuitive – but the route via Paris is usually quicker than if there were a “direct” flight to the Dutch Caribbean. 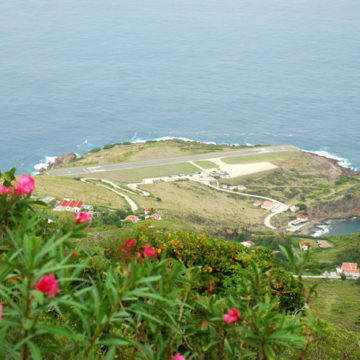 The flight to Saba from St. Martin is a very short island hop with a Caribbean airline – Winair. There are around 4 flights per day – both ways – and we will naturally take the most convenient connection for you. 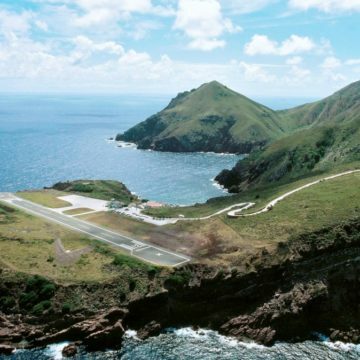 The flight is less than 15 minutes between St. Martin and Saba. It is important to know which days of the week you can travel – as we will always look for the best fare and schedule for you – and give you the best options for you to decide.